Add courgette, pepper & onion. Fry for 5 minutes until start to soften. Make a gap in the centre of the pan. Spray 2 sprays of oil in the centre & crack in the eggs. Cook for 2-3 minutes until eggs are as you like them. Scatter over a few basil leaves & the black pepper. Serve with 80mg of sliced melon on the side. TOP TIP: Cook vegetables for less time if you like them "al dente" It gives the dish a lovely crunch. Pre-heat oven to 350°F/180°C/Gas Mark 4/ (160°Fan). 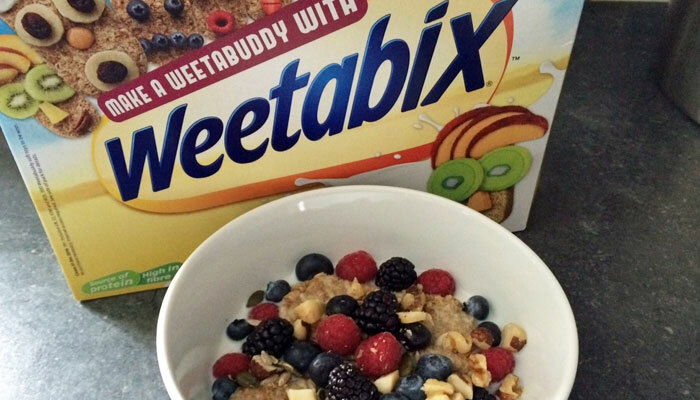 Put all ingredients into a large bowl & mix together. Put mixture into a large deep rectangular tray. Put in bottom shelf of oven for 15-20 minutes, taking care not to burn seeds. 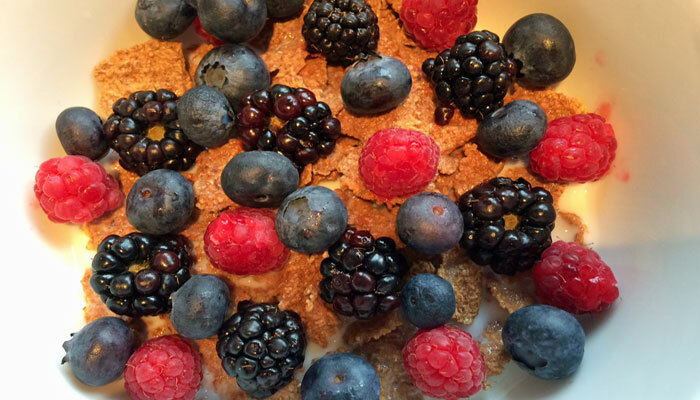 TOP TIP: You can mix any berries but one of my favourites is raspberries & blueberries. 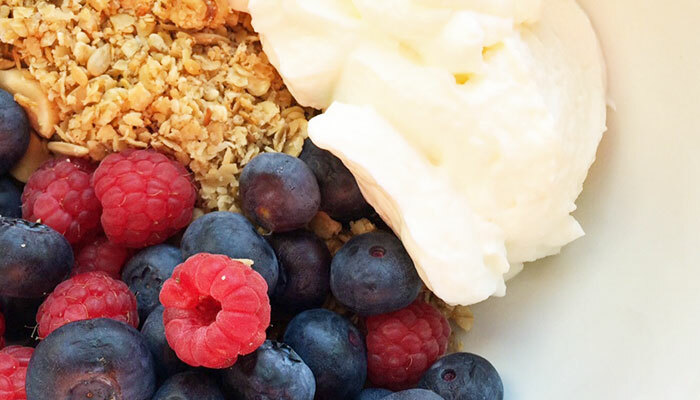 The tartness of the raspberries combine beautifully with the sweetness of the blueberries, the smooth velvet of the greek yoghurt & the crunch of the nuts & seeds in the granola. Heaven! 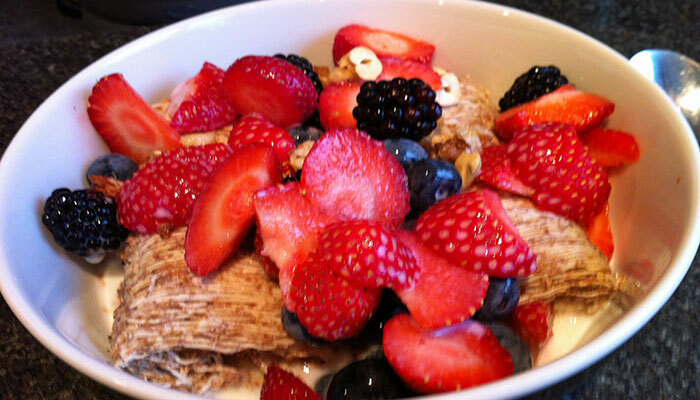 Mix the porridge with the milk in a cereal bowl. Microwave for approx 3 minutes on power 600. Remove & stir. If it needs to be thickened up a bit more, cook for a further 1 minute on power 600. Stir thoroughly. Place a non-stick frying pan over a medium-high heat. Sprinkle with a pinch of ground mixed spice. Mix thoroughly. Cook for approx 1 minute until fruit softens. 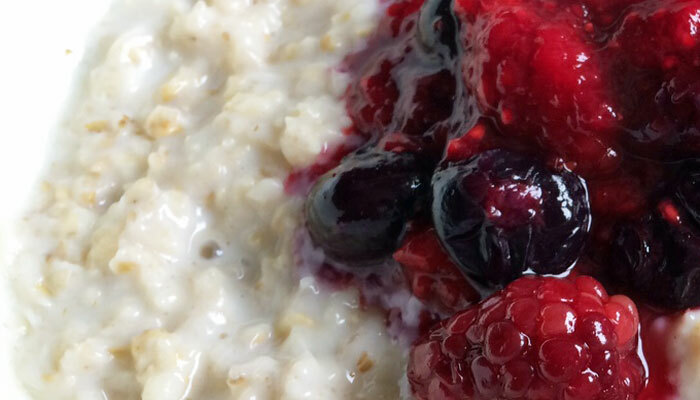 Spoon the warm, spiced berries over the porridge & serve immediately. 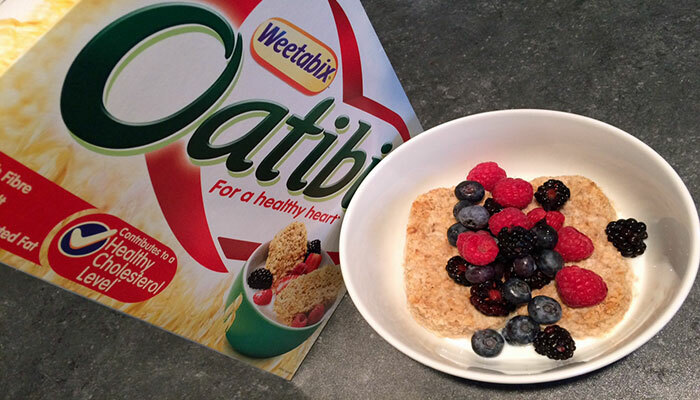 TOP TIP: Cooking the fruit for just a minute until softened brings out the sweetness without the need for extra sugar. Heat the 1/2 tbsp of butter in a frying pan on a medium-high heat. Add sliced mushrooms & cook until nicely browned. 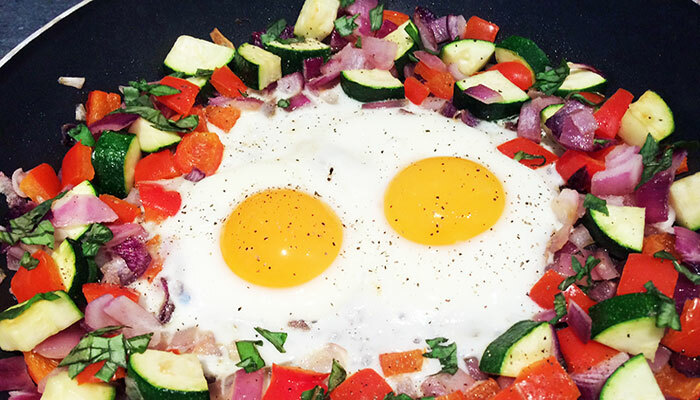 Whilst cooking, heat the 1 tsp oil in a small frying pan on a gentle heat & crack in the eggs. 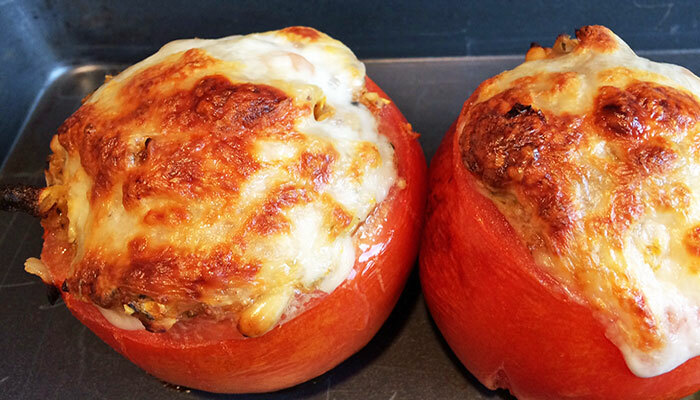 Put tomatoes under a heated grill. Cook all until cooked to taste. Toast, butter (using other 1 tbsp butter) & slice toast & put out on a warmed plate along with cooked egg, mushrooms & tomatoes. Sprinkle with black pepper & serve immediately with sliced melon. TOP TIP: For added flavour, swap tomatoes for seasonal tomatoes on the vine (80g per person). Fry mushrooms on a medium heat until nicely browned. Whilst mushrooms cooking, grill tomatoes. Toast bread & spread with the butter. 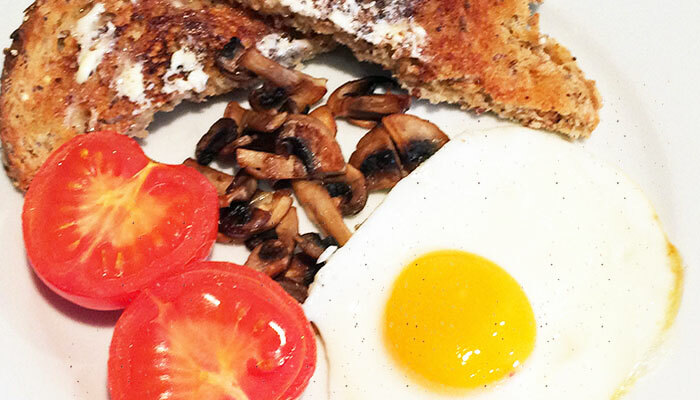 Put toasted bread onto a plate, top with mushrooms & tomatoes. Sprinkle with black pepper & salt. Serve immediately with pink grapefruit juice. 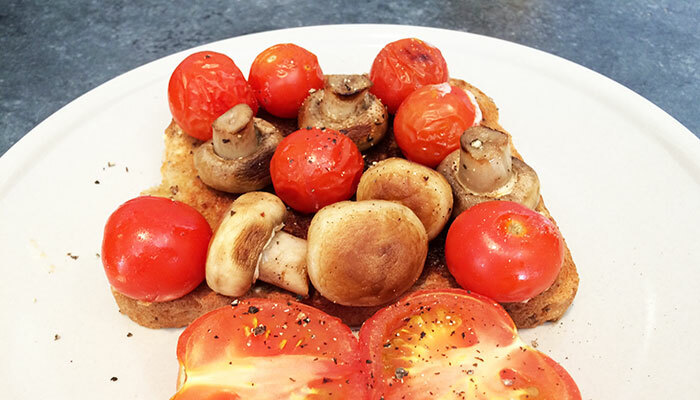 TOP TIP: Just as nice without buttering the toast as the crunch offsets the softness of the mushrooms & tomatoes. Use any mushrooms you like. Spray the rapeseed oil into a warmed medium non-stick frying pan. Add mushrooms & green pepper. Stir & cook over a medium heat for a few minutes. Whilst cooking, put tomatoes under grill. 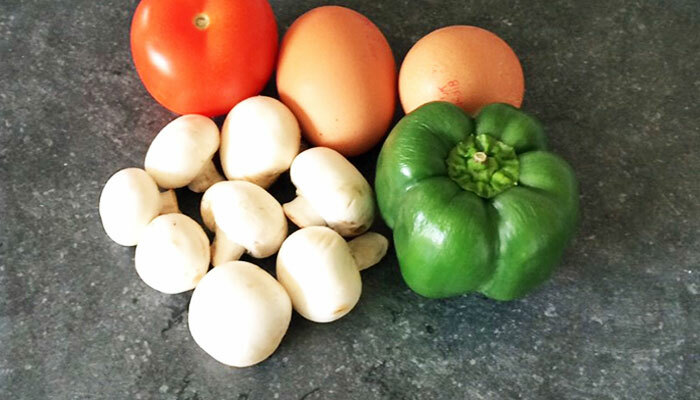 Mix salt into whisked eggs & pour over mushroom & peppers. 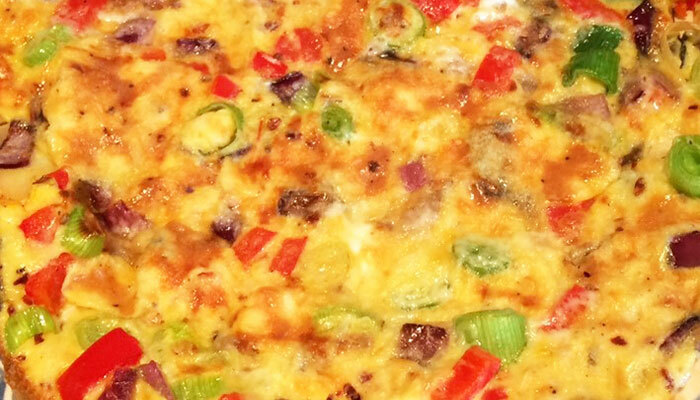 Cook gently over a low-medium heat until omelette cooked to taste. Serve immediately with the grilled tomatoes & juice. TOP TIP: For a change, use a diced onion with the pepper instead of mushrooms. Break eggs onto a plate gently, without breaking yolks. Bring a pan of water to boil & carefully slide in the eggs. Place a lid on the pan & turn the heat off. Leave eggs to poach for appx 3 minutes. Remove with a slotted spoon & set aside on a clean plate. Keep warm. Toast bread & warm olive spread in a saucepan. Add garlic & lemon juice to melted spread & stir well. Heat through for 1-2 minutes, until spinach wilted. Place bed of spinach onto each plate, squeezing gently to remove excess fluid. Put a poached egg on top of spinach & sprinkle with black pepper. Cut toast up into fingers. 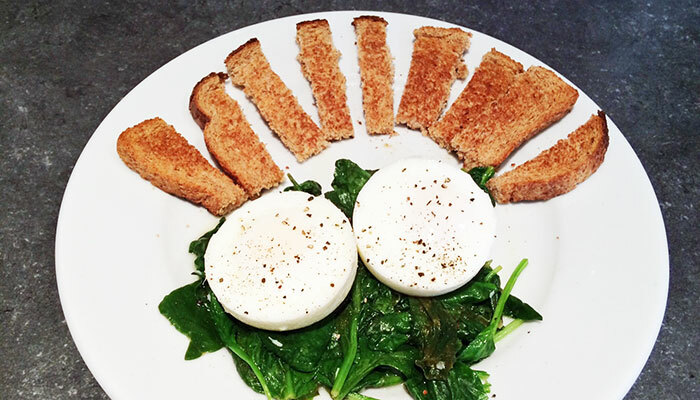 Put on plate away from spinach to keep toast crisp. Serve immediately with slice of melon on the side. 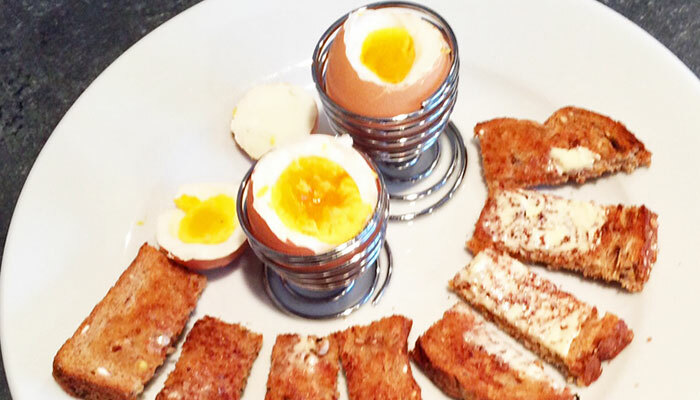 TOP TIP: Use an egg poacher pan if you have one instead of poaching eggs in pan of water. Heat oil gently in a deep base lidded-frying pan. Add garlic & salt & cook for 30 seconds. Add spinach & cook until wilted. Mix in cherry tomatoes, tinned tomatoes, chilli flakes, cumin, oregano & basil. Cover & simmer for 5-10 minutes until thickened. Push mixture to sides of pan. Break eggs into centre of pan. Cover & simmer for 5-10 minutes until eggs cooked to taste. Season with black pepper. Dress with a few basil leaves. Serve with melon on side. TOP TIP: This dish does give quite a spice. If you prefer less spice, omit or reduce the amount of chilli flakes. Pour tomato juice into a lidded deep-based frying pan. Add prepared vegetables, tomato, basil & salt. Bring to boil. Cover & simmer for 8-10 minutes. Remove lid. Push vegetables to sides of pan. Crack eggs into centre of pan. Cook until eggs cooked to taste. Serve immediately with the pink grapefruit juice. 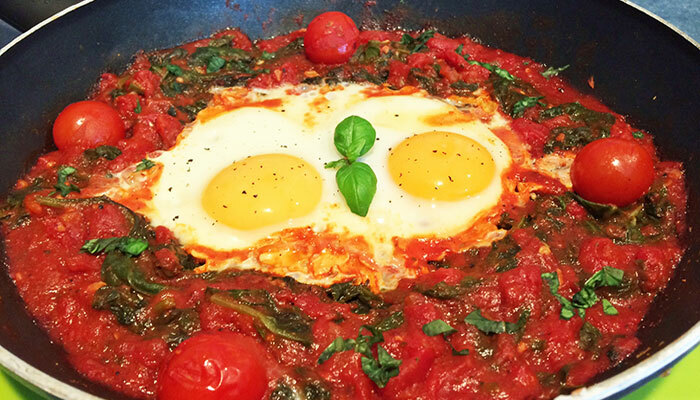 TOP TIP: Don't overcook the vegetables in the first stage as they will cook further when the eggs are cooking. Heat oil in a medium non-stick frying pan. Add pepper & onion. Stir & cook over a medium heat for a few minutes. Mix salt, black pepper & basil into whisked eggs & pour over pepper & onion. Cook, stirring gently with a fork until eggs starts to set then stop. 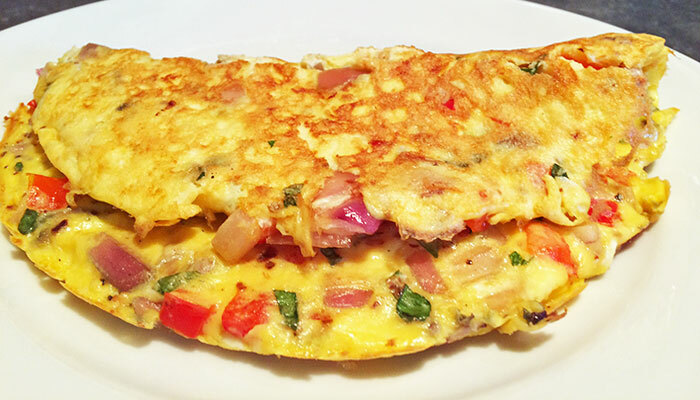 Continue to cook gently over a low-medium heat until omelette cooked to taste. TOP TIP: Put under grill for a couple of minutes if omelette cooked underneath but not quite set on top. Mix chicken with crushed garlic, mixed herbs & black pepper. Cover & chill for 1 hour. Preheat oven to 180°C/350°F/Gas Mark 4 (160° fan). Heat the oil, on the hob, in a large oven-proof casserole dish. Saute chicken for 4 minutes. Remove chicken & set aside. Prepare stock. Put 50mls of the stock in the pot. Cook onion, celery, carrots & sweet potatoes for 5 minutes. Drain & rinse kidney beans under cold running water. Drain. Add tomatoes, kidney beans & orange zest to pot. Add chicken, rest of stock & bay leaf. Bring to boil. Cover & transfer to oven. Bake for 25 minutes. Remove bayleaf. Mix breadcrumbs & grated cheese. Sprinkle on top. Bake uncovered for another 10-15 minutes. Meanwhile, cook broccoli by preferred method until texture to taste. Drain. Serve. 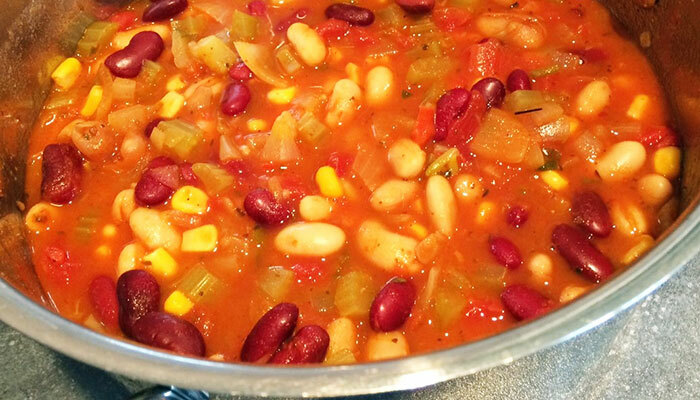 TOP TIP: Always opt for beans & pulses tinned in water with no added salt or sugar. Pour oil into a non-stick pan, heat & fry chicken for 4-5 minutes until starting to brown. Meanwhile, make stock. Add green pepper, celery & onions to a separate non-stick pan with 50mls of the stock. Cover & cook on a high heat for a few minutes to soften. Add tomatoes, spices, thyme, black pepper & chicken. Stir in rice & remaining stock. Bring to boil. Cover closely & simmer for about 20 minutes, until rice is tender & absorbed, stirring regularly. Combine spices, sugar & black pepper. Coat chicken. Cook in George foreman style grill (brushed with a bit of the oil) for 6 mins or until fully cooked. Cut into strips. Whilst chicken cooking, heat remaining oil in wok or large frying pan. Fry onions & peppers for a few minutes until to taste. Add chicken strips & stir. Serve with warm tortillas, sour cream & salsa. TOP TIP: Use small (approx 41g) wholewheat tortilla wraps, or if you prefer a bigger wrap, Sainsbury's Good for you wraps also meet the nutritional values. Slash top of chicken breast fillets with a sharp knife. Mix the 1 tbsp rosemary, garlic & oil together. Brush some of the flavoured oil over chicken breasts, cover & chill for 15 mins. Bring back to room temperature. Heat oven to 200°c/400°F/Gas Mark 6(180° fan). In a large roasting tin, heat remaining rosemary, garlic & oil mix. Put chicken in roasting tin, with slices of lemon above & below chicken. This will help to keep chicken moist. Top each breast with a sprig of rosemary. Cook for 10 mins. Boil pan of water. Cut aubergine into thick chunks & blanche in the boiling water for 2 minutes. Drain. 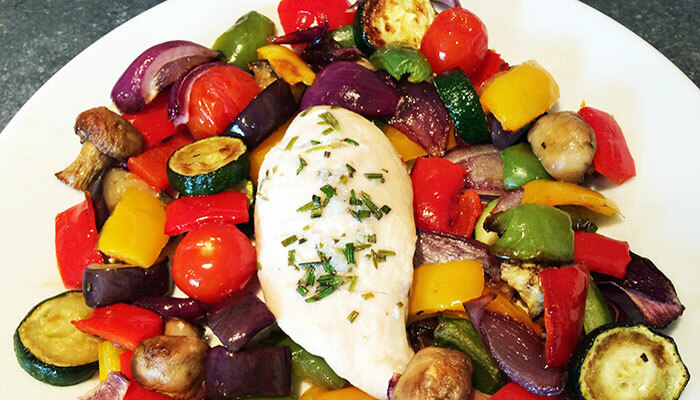 Toss aubergine, onions, courgettes, mushrooms & peppers in the hot oil around the chicken. Roast chicken & vegetables for 15 mins. Add cherry tomatoes & cook for a further 5 minutes. Once chicken is cooked thoroughly, remove lemons & rosemary sprigs. Serve. TOP TIP: When serving, squeeze the juice from the warm lemon slices over chicken for extra flavour & moisture. Pre-heat oven 190°C /375°F/ Gas Mark 5 (170°Fan). In a large flameproof pot, heat olive oil on hob over a medium-high heat. Sauté the chicken pieces, stirring often, for about 5 minutes or until browned on all sides. Transfer chicken to a plate. In same pot, throw in vegetables, garlic, bay leaf & coriander. Boil pan of water. Cut aubergine into smallish pieces & blanche in the boiling water for 2 minutes. 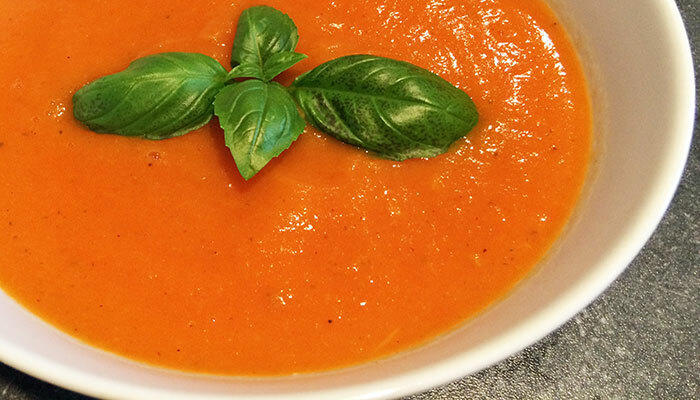 In a bowl mix passata, tomato puree, paprika, oregano, basil, worcestershire sauce, black pepper & cayenne pepper if used. Pour over the vegetables. Stir. Add chicken & aubergine. 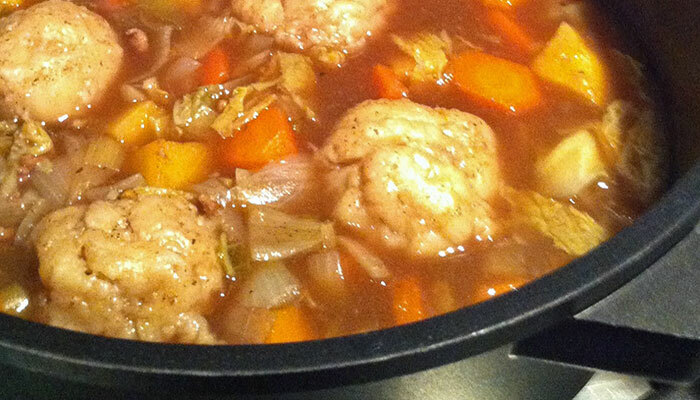 Make stock & pour over chicken & vegetables. Stir. Cover & bring to boil. Cover & transfer to oven. Cook for 1.5 hours. Remove bay leaf prior to serving. 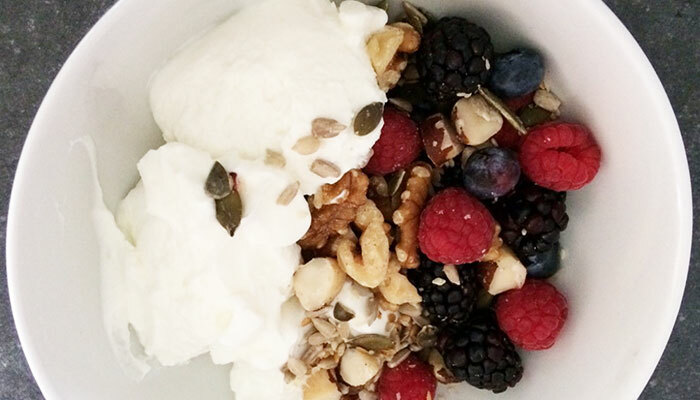 TOP TIP: A low calorie dish but a blast of goodness! If you would like to cook it quicker, cover & simmer it on the hob for 45 minutes. Crush garlic & mix with ground ginger. Add a splash of water & mix. Heat oil & sweat onions gently until browned. Add ginger & garlic paste. Continue cooking until water has dried off (approx. 30 seconds). Stir in ground coriander & chilli powder followed by chopped tomatoes. Cover & simmer until tomatoes have softened. Remove lid & cook for another 5 minutes. Add chicken & brown both sides. Add 150 mls water & red pepper & bring to boil. Turn down heat, cover & simmer for 10 minutes or so until chicken cooked through. Whilst chicken cooking, cook basmati rice as per instructions. Remove lid from chicken, turn up heat & boil rapidly for a couple of minutes. Take off heat. Add sour cream, garam masala & fresh coriander & stir. TOP TIP: Any sour cream can be used to fit within values. It doesn't need to be reduced fat. Pre heat oven to 170°C/325°F/Gas Mark 3 (140° fan). Heat oil on hob in a flameproof casserole dish. Cook chicken on both sides until lightly brown. Add onions & cook until softened. Add carrots. 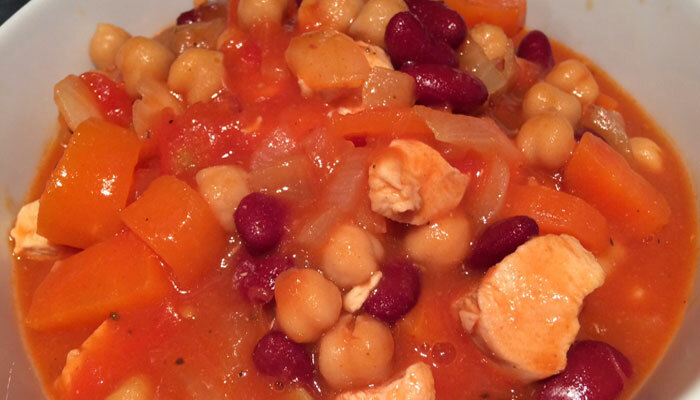 Drain & rinse chickpeas & kidney beans & add to casserole dish along with tomatoes. Dissolve stock pot in the 700mls of boiling water. Blend cornflour in a cup with a little of the stock. Add to casserole with remainder of stock, Tabasco sauce, tomato puree & black pepper. Stir. Bring to boil, cover & transfer to oven. Cook for a minimum of 1 hour, 15 minutes. TOP TIP: Cooking for longer increases the depth of flavour of this dish. Pour peri-peri marinade into a lidded container. Add celery, peppers, onions & chicken. Mix. Put lid on & marinate in fridge for a few hours or overnight. Heat oven to 200°C/400°F/Gas Mark 6 (180°Fan). Cut a large enough piece of foil to put chicken mix in & wrap up into a parcel. Bake peri-peri chicken in the foil in centre of oven for 25-30 minutes. Whilst chicken cooking, prepare stock using 1/2 stock pot & 400mls water. Lightly crush cardamom pods & coriander seeds. Fry all spices & garlic for 1 minute, stirring all the time. Add rice & stock. Mix. Bring to boil. Cover & simmer for 15-20 minutes, until rice tender & absorbed, stirring occasionally. Dry fry sunflower & sesame seeds lightly. Set to one side. Remove cardamom pods from rice. Stir seeds into rice. 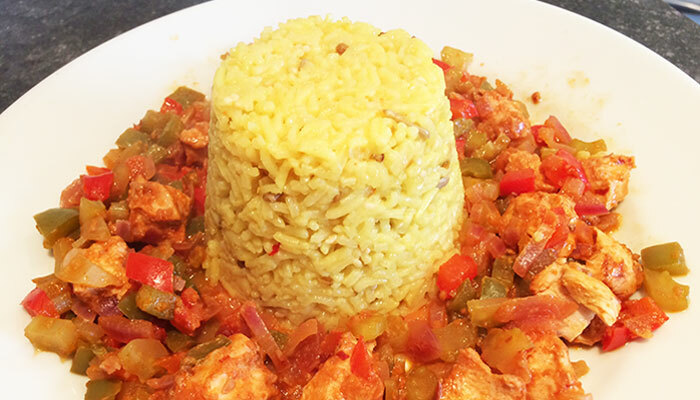 Serve per-peri chicken with the spicy rice. TOP TIP: Use medium or hot per-peri marinade according to how hot you like it. Par boil potato slices in boiling water for 3-4 minutes only. Drain & leave to dry out. Preheat oven to 170°c /325°F/Gas Mark 3 (150° fan). On the hob, heat 1 tbsp of the oil in an oven proof, lidded casserole pot. Sautee beef & onions on a high heat for 3-4 minutes. 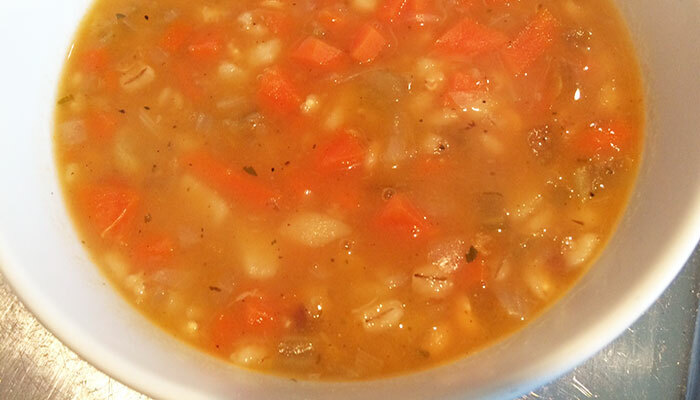 Stir in carrots, swede, celery, mushrooms, prepared lentils & 1/2 tsp of the black pepper. Dissolve stock pot in 750mls of boiling water. Add stock, worcestershire sauce, mixed herbs & bay leaf. Stir. Bring to boil. Cover & transfer to oven. Cook for approx 2 hours, or until meat tender. Remove & increase oven heat to 200°c /400°F/Gas Mark 6 (180° fan). Transfer hotpot to a large, rectangular oven-proof dish. Remove bay leaf. Layer sliced potatoes on top of hotpot, overlapping edges slightly. Brush with remaining oil. Return to oven uncovered for 30-40 mins, until potatoes fully cooked & nicely browned. Cook cabbage by preferred method, to preferred texture. Sprinkle with other 1/2 tsp of black pepper. Serve hotpot with savoy & red cabbage. TOP TIP: Don't overlap potatoes too much if want crispy. 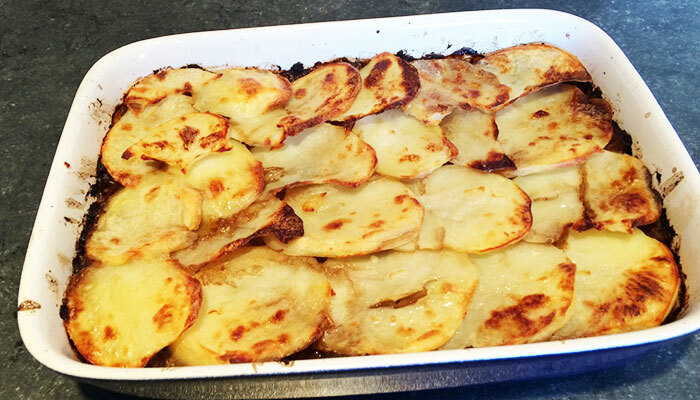 If you have too many potatoes to fit on the dish, place rest on a lightly oiled baking tray & cook separately for approx 20 minutes. Heat oil in large frying pan or wok. Add onion & garlic & cook gently until softened. Add mince & cook until browned. Add pepper, chillis & all spices. Cook for 2-3 mins. Add tomatoes & tomato puree. Dissolve stock pot in the 600mls of boiling water & add. Bring to boil & simmer for 15 mins. Add black pepper & kidney beans. Heat for 20 mins or until stock reduced/desired consistency. Pre-heat oven 180°C/350°F/Gas mark 4 (160° fan). Bring a pan of water to boil & parboil potato wedges for 5-8 minutes. Drain & shake. Melt butter & oil in large pan. Add onions & sweat for 3-4 minutes. Add chillis & spices. Stir. Add potato wedges, toss well & fry for 2-3 mins. Put in oven for approx. 20 mins until browned. 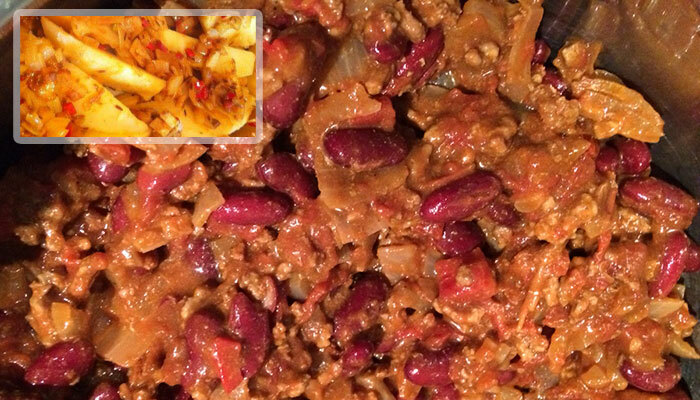 TOP TIP: The chilli makes a great batch, suitable for freezing for a quick meal. If you don't want the spicy wedges, you can eat the chilli with a large baked potato & salad instead. 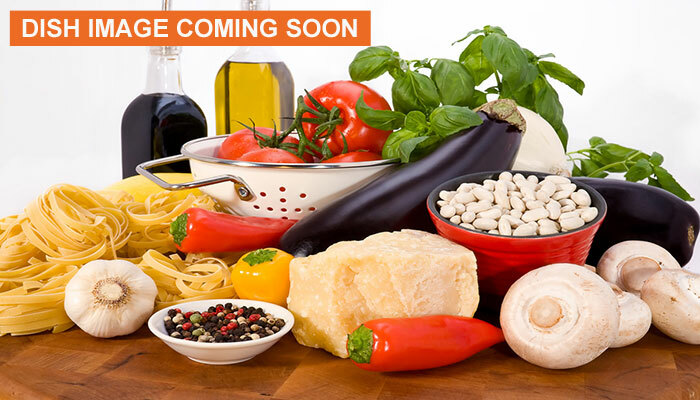 Prepare all ingredients. Bring pan of water with the 1/2 tsp salt to boil. Boil potatoes for 15 mins or until tender. Drain & mash with milk. Heat oil in large wok or frying pan. Cook onion until soft. Add mince & cook until browned. Add carrots, celery & garlic & cook for approx. 5 mins, stirring occasionally. Sprinkle flour over meat & vegetables & stir. Dissolve stock in the 150mls of boiling water. Add tinned tomatoes, stock, worcestershire sauce, herbs & 1/4 tsp of the black pepper. Stir. Bring to boil. Reduce heat. Simmer for 20 mins, stirring occasionally. Put mixture in oven proof dish. Spoon mash potatoes on top & fluff with a fork. Put under hot grill or cook in pre-heated oven at 200°C/400°F/Gas Mark 6 (180° fan) until nicely browned. Cook savoy cabbage as preferred. Drain. Season with the other 1/4 tsp of black pepper. 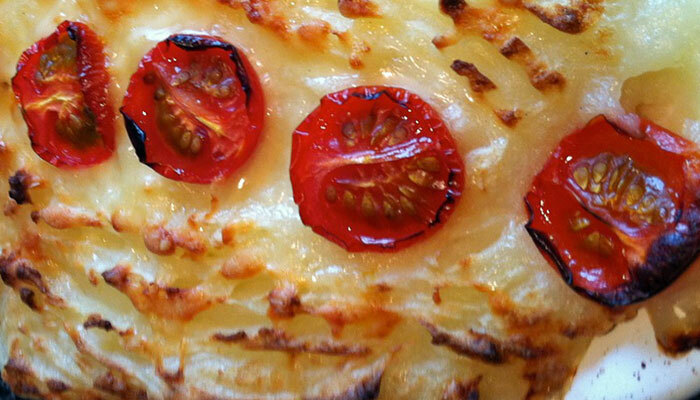 Serve cottage pie with the savoy cabbage & fresh beetroot. TOP TIP: For a lighter, fluffier mash use potatoes such as Maris piper or Russet. Bring 2 pans of water to boil. Add 1/4 tsp salt to each pan. Blanch aubergine in boiling water for 2 mins. Drain. Parboil potatoes for 5-6 mins. Drain. Heat oil in a frying pan. Fry minced beef, onions, thyme, parsley & cinnamon until meat browns. Stir frequently. Add tomatoes, tomato puree, aubergine & black pepper. Mix well & spread evenly in a casserole dish. Arrange slices of potato to cover beef mixture completely. Heat oven 190°C /375°F/ Gas Mark 5 (170°Fan). Beat together egg yolks, yoghurt & grated cheese. Pour topping over potatoes to cover completely. Bake uncovered for 45 mins-1 hour or until golden brown. Cook seasonal greens to taste. Season with black pepper. Serve. TOP TIP: Choose any seasonal greens to get a variety. Why not try something a bit different? Prepare all vegetables. Heat oil gently in a large frying pan or wok. Add onion & sauté gently for 5 mins until softened. Mix in carrots, celery & garlic & cook for a further 5 mins. Turn up hob to a medium heat. Add mince & stir in. Cook until browned. Add mushrooms & cook for 1 more minute. Dissolve stock pot in the 300mls of boiling water. Stir in stock, tomatoes, tomato puree & mixed herbs. Bring to boil. Cook on a medium heat for 30 minutes, stirring occasionally. Season with black pepper. Pre heat oven to 200°C/ 400°F /Gas Mark 6, (180°Fan). Melt olive spread in deep pan. Add flour, mix together & cook for 1 minute, stirring continuously. Add milk slowly, maintaining stirring all the time. Add 1/2 the grated cheese. Continue stirring & cooking until sauce thickens. Put 1/2 the bolognaise sauce into bottom of a large ovenproof dish. Lay 3 pasta sheets on top. Put remaining bolognaise sauce on top of pasta sheets & lay 3 more on top. Pour sauce over pasta sheets & sprinkle on remaining grated cheese. Put in oven for approx. 25 minutes	until golden. Serve with mixed salad & garlic slices cooked as per instructions. TOP TIP: To fit in with nutritional values, garlic slices used must be Sainsbury's Be good to yourself range. 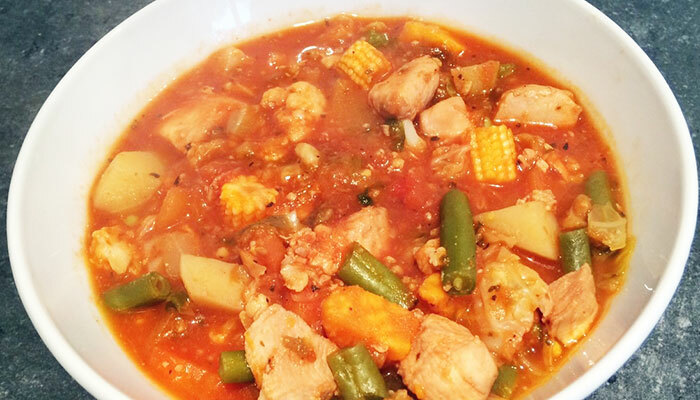 This dish tastes great the next day & is also great for freezing to make a quick meal when busy. Peel & chop all vegetables into small chunks, keeping onions separate. Heat oil in a large lidded pan & sweat onion for 5-10 mins. Make stock & add to pan. Add vegetables, black pepper & herbs. Bring to boil. Cover & simmer for 30 mins or until vegetables tender. Mix cornflour with a little water & stir into pot. Leave to simmer whilst preparing dumplings. Sieve flour into a bowl. Add suet & mix. Split dough into 8 small dumplings & add to pan. Cover & simmer for a further 20 mins until dumplings are cooked. TOP TIP: Add some mixed herbs to the dumplings to make herby dumplings if you wish. Heat oil in a large saucepan & add onions, garlic, celery, carrots & mushrooms if using. Cook for about 3-4 minutes or until onion has softened, stirring regularly. Add minced beef & tomato puree & cook until meat browned. Prepare stock. Add stock to saucepan, along with wine (if used), tomatoes, black pepper & basil. If you don't use the red wine, add 150mls of extra water to the stock. Bring to boil. Lower heat & simmer very gently for approx 1 hour (until sauce well reduced), stirring occasionally. Boil a pan of water with the 1/2 tsp salt. Cook spaghetti as per packet instructions. Drain. Serve with bolognaise sauce sprinkled with the grated parmesan if used. 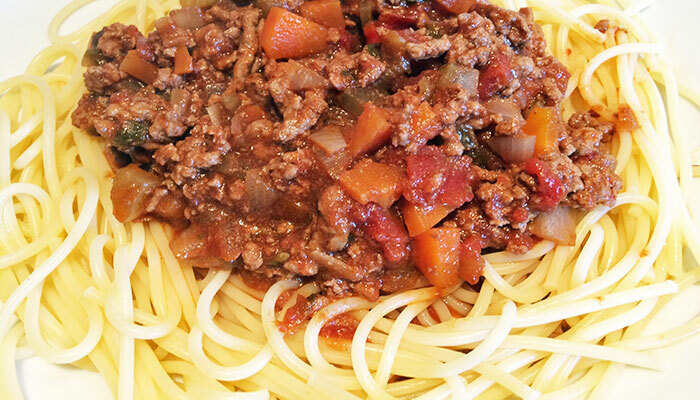 TOP TIP: If you find the spaghetti a bit bland on it's own, mix it with the bolognaise, then serve & top with parmesan. Heat oven to 180°C/350°F/Gas Mark 4 (160°Fan). In a large, flameproof casserole dish, heat olive oil over a medium-high heat. Sauté pork, stirring often, for about 5 minutes or until browned on all sides. Transfer pork to a plate. In same pot, throw in prepared vegetables (except aubergine), garlic, bay leaf & parsley. 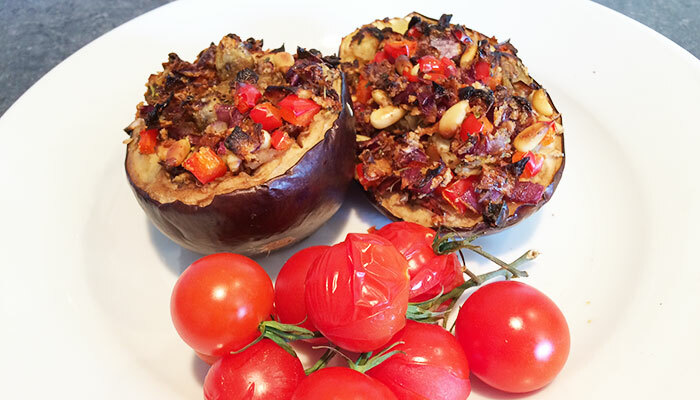 Cut aubergine into chunks. Blanche in boiling water for 2 minutes. Drain & set aside. Pour over vegetables. Add pork & aubergine. Stir. Dissolve stock pot in the 1 litre of boiling water & add to pot. Stir. Bring to boil. Cover & cook in oven for approx 1 hour, or until pork & vegetables tender. TOP TIP: Low calorie dish but highly nutritious. 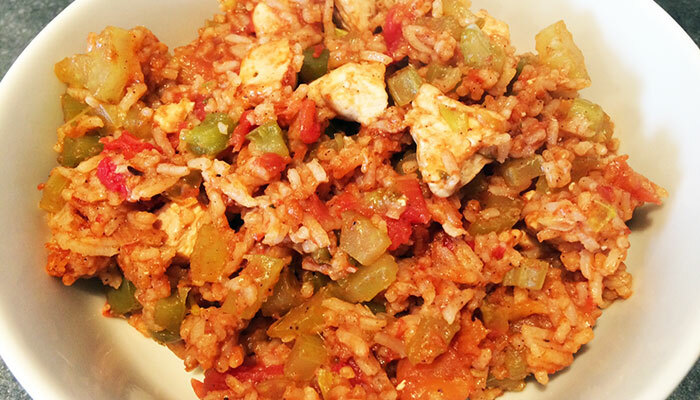 The cayenne pepper gives just a bit of spice to the dish but it isn't at all hot. In a bowl, mix diced beef, red wine, mixed herbs, black pepper & garlic clove. Cover & leave in fridge to marinate for 1-4 hours. Trim shallots. Parboil for 2 minutes with skins on. Plunge into cold water for 1 minute. Drain. Remove skins. Set aside. Remove beef from marinade & dry on kitchen roll. Keep marinade. Pre-heat oven to 180°C/350°F/Gas Mark 4(160° fan). Heat oil on hob in a flameproof casserole pot. Add marinated beef & cook on a high heat for 5-6 minutes, stirring frequently. Remove meat from pan. Add 2 tbsps marinade to pan & stir to deglaze. Keep in pan. Add carrots, mushrooms & shallots & cook for 2-3 mins. Add beef. Shake flour over & stir. Dissolve stock pot in the 500mls of boiling water. Stir in sugar. Pour over beef & mix well. Add remaining marinade & bring to boil. Cover & transfer to oven. Bake for appx 1.5-2 hours, or until meat tender. After 1 hour, check there is enough water left in pot. If very low, add a bit more boiling water. 20 mins before end of cooking time, boil potatoes in salted water (using the 1/2 tsp salt) until soft (approx 15 mins). Drain potatoes & mash with milk. 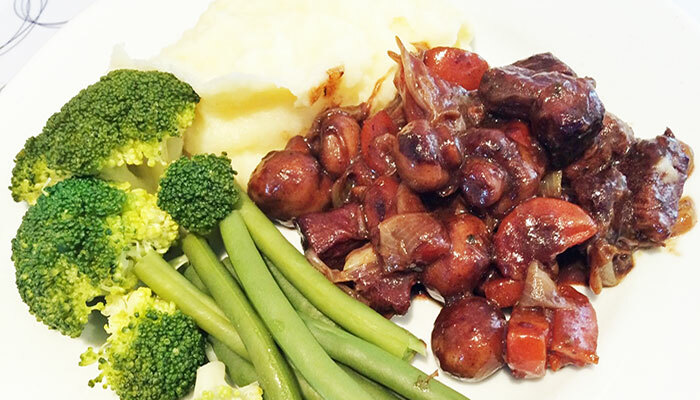 Serve bourguignon with mash & seasonal greens cooked to taste. TOP TIP: The beef can be left marinating overnight in fridge if it makes it easier to prep the day before. Heat oil on hob in a flameproof lidded casserole pot. Add beef & cook on a high heat for 5-6 minutes, stirring frequently. Remove meat from pan. Coat with flour & set to one side. Add carrots, mushrooms & onions to pan & cook for 2-3 mins. Add beef & mixed herbs & stir. Dissolve 1/2 stock pot in the 500mls of boiling water. Pour over beef & vegetables. Mix well. Check periodically. If stock low, add a bit more boiling water. 20 mins before end of cooking time, boil potatoes in salted water (using the 1/4 tsp salt) until soft (approx 15 mins). 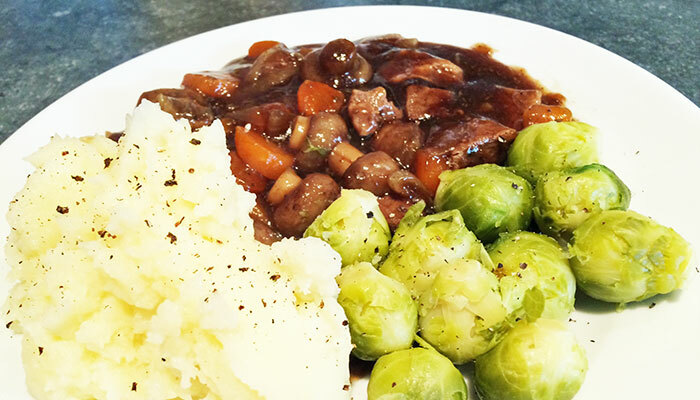 Serve braised steak with mash & sprouts cooked to taste. TOP TIP: Don't like sprouts! Use 160g of any seasonal greens. Mix Cornflour with the tbsp water. Stir in the soy sauce, ginger paste and honey & set aside. Dry fry sesame seeds in a small saucepan & set aside. Heat oil in a wok over a high heat. Cook diced pork according to packet instructions. Add mediterranean vegetables, beansprouts & garlic & cook for 2-3 mins over a high heat. Reduce heat. Stir in the ginger, soy & honey sauce. Stir & cook until sauce bubbles & thickens. Serve immediately topped with the toasted sesame seeds. TOP TIP: I use the prepared packets of mediterannean veg as it is so much quicker, easier & cheaper than buying individual items but individual items can be used if preferred. Preheat oven to 200°C/400°F/Gas mark 6 (180°fan). Trim shallots at each end. Parboil for 5 minutes with skins on. Plunge into cold water for 1 minute. Remove skins. Parboil potatoes in salted water (using the 1/2 tsp salt) for 7-8 minutes. Drain. Line a large roasting tin with foil. Put olive oil in roasting tin & heat oil for a few minutes in the oven. Add potatoes, shallots & red pepper. Toss in oil. Roast for 15 minutes. Make a space in middle of the tray. Put salmon in middle of the tray with slices of lemon underneath & above. Add courgettes & toss in the hot oil. Cook for 10 mins. Pierce tomatoes. Add to tray with sprigs of rosemary. Cook for a further 5 mins. Mix sour cream, chives & paprika. Remove rosemary sprigs. Serve traybake with sour cream as a dip. 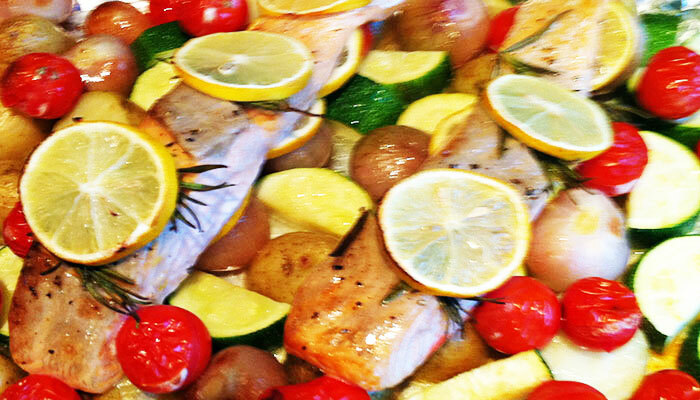 TOP TIP: Squeeze the warm lemon over salmon on serving to increase moisture & taste. Mix oil, lime zest & juice from 1 lime, ginger, garlic, chilli & cayenne pepper in a dish. Lay salmon fillets in the marinade & coat. Cover & leave in fridge to marinate for approx 2 hours. Heat a non-stick frying pan or wok on hob. Take fish out of marinade & keep remaining marinade to one side. Fry fish on a medium heat for approx 4 minutes each side. Remove & set aside. Bring a small pan of water to boil. Cook noodles in boiling water according to packet instructions then drain & set aside. Whilst noodles cooking, heat remaining marinade. Stir fry broccoli & red pepper for 2-3 minutes. 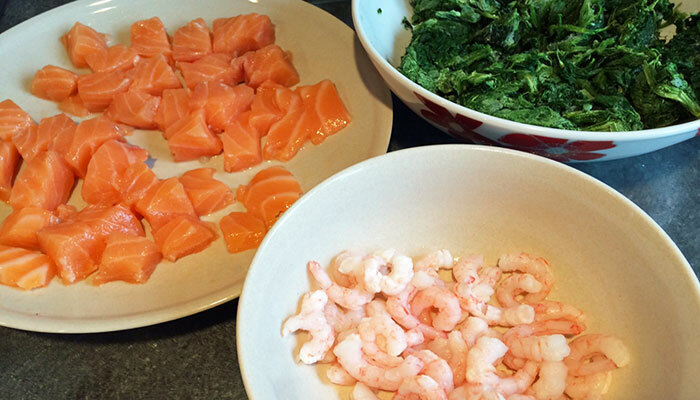 Remove skin from salmon & flake 160g salmon into stir fry. Stir noodles into stir fry & heat through. Stir in the juice of 1/2 lime & serve. TOP TIP: Cooking the salmon doesn't require any further oil as there is plenty in the marinade. It is easier to cook the full salmon fillets & then weigh 160g once flaked rather than trying to get the right weight before cooking. Boil potatoes with the 1/2 tsp salt until soft then mash with 100mls of the milk. Put to one side. Pre-heat oven to 190°C/375°F/Gas mark 5 (170°fan). Heat oil in pan on hob & gently sweat onions until softened. Meanwhile, in a bowl mix the remaining 200mls of milk, garlic & herb cheese, mustard, dill & lemon juice. Add this to softened onions, gently stirring & heating through. In an oval/rectangular pie dish arrange the raw mixed fish. Pour the milk mixture over the fish. Top with the mashed potato & fluff with a fork. Lay the sliced tomatoes on top. Put on middle shelf of oven for 30-35 minutes. Serve with green beans cooked to taste. TOP TIP: You can buy packets of mixed fish already cut into small pieces. It is much cheaper than buying separate cuts of fish too! Heat oil in a large frying pan or wok. Cook salmon for approx 4 minutes each side. Flake salmon & set aside. Keep oil in frying pan. Make stock & bring to boil in a large saucepan. Add broccoli,asparagus, peas & broad beans. Simmer for 4-5 minutes until "al dente." Remove from stock & set aside. Top stock back up to 500mls by adding hot water. Keep stock on a low heat. Warm oil left from salmon in same frying pan salmon cooked in. Slice leeks & cook on a medium heat for 2-3 minutes. Add 2-3 tbsps of hot stock. Stir in rice. Cook gently until liquid absorbed. Stir continuously. Continue adding stock a bit at a time, stirring continuously, until rice cooked to taste & fluid absorbed. This will take approx 15-20 minutes. Stir in pesto, black pepper, flaked salmon & vegetables. Cook until heated through. Serve. TOP TIP: This dish is very filling. Eat it as a vegetarian dish if you prefer, without the salmon. 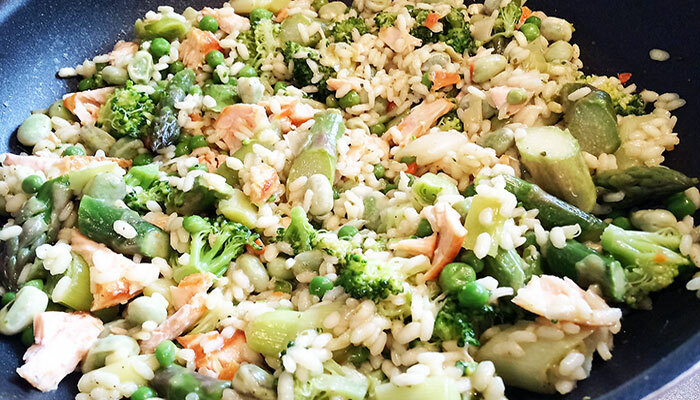 See recipe for "Spring vegetable risotto". Cook potatoes for 15-20mins in salted water (using the 1/4 tsp salt) until tender. Drain. Add 100 mls of the milk & mash. Set aside. If using fresh spinach, cook spinach in a little boiling water for 2 mins. Drain & gently squeeze excess moisture. (If using frozen spinach, once defrosted drain any excess water). Melt olive spread in a pan & sauté onion gently for 5-8 mins. Add flour. Mix & cook for 1 min. Gradually add the other 100mls milk over low heat to make a paste. Make stock by adding 500mls hot water to 1 fish stock pot. Add 150mls to the paste & discard rest of stock. Stir & bring to boil. Reduce heat. Simmer for 2 mins. 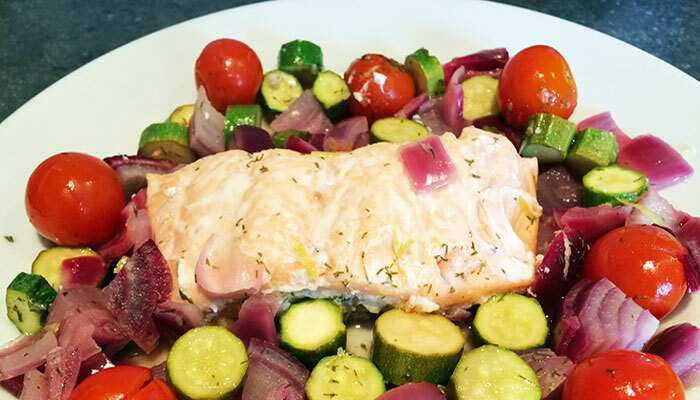 Cut raw salmon into chunks & arrange in an ovenproof dish or 2 individual dishes. Pour sauce over the fish. Arrange spinach on top. Cover with mash & fluff with a fork. Bake uncovered in oven for approx 35mins. Serve with seasonal greens & carrots cooked to taste. 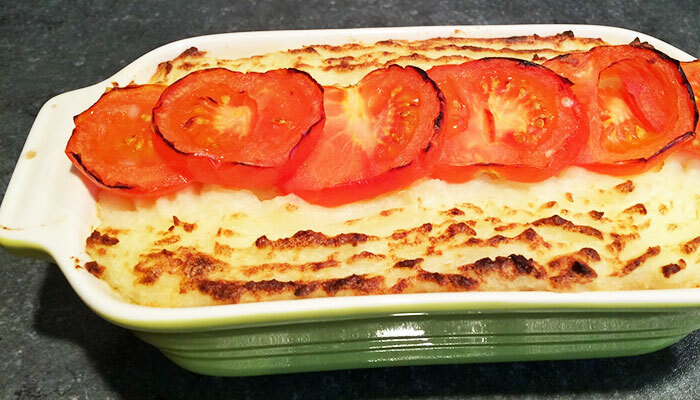 TOP TIP: Using smaller individual baking dishes is helpful for spreading the mashed potato. Blend blueberries & white wine until smooth. Set aside. 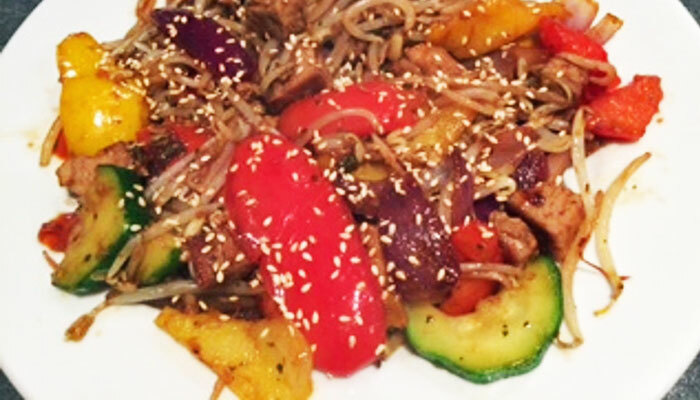 Place sesame seeds, whisked egg yolks & black pepper into a bowl & mix. Add tuna & coat thoroughly. Cook sweet potato in a pan of boiling water until tender. Drain, mash & keep warm. Whilst sweet potato cooking, steam broccoli & red pepper for appx 10 minutes. Turn off steamer but keep warm. 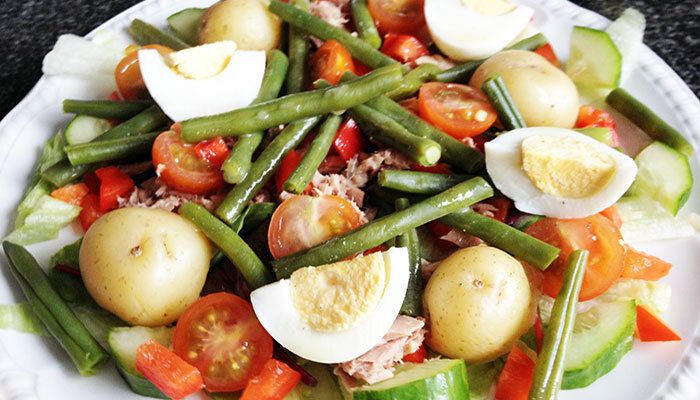 Heat olive oil in a frying pan & cook tuna for 3-4 mins each side or until cooked through. Arrange broccoli & red pepper onto serving plate & put sweet potato in middle. Place tuna on top of sweet potato & pour blueberry sauce over tuna. 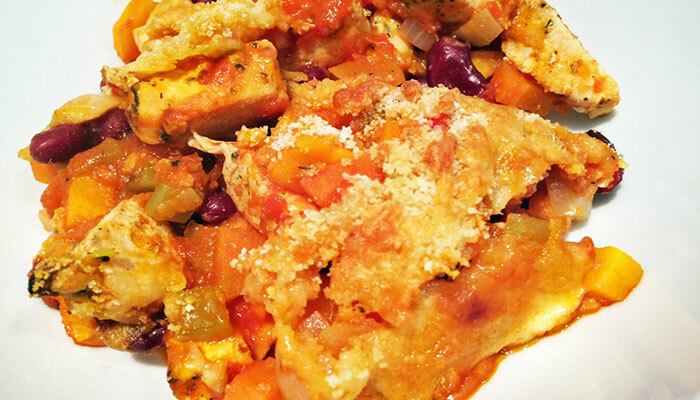 TOP TIP: This recipe has been adapted from one of Gino D'Acampo's & is a good source of Omega 3. Ginger, lime & coriander seabass with roasted vegetables. Mix the olive oil, coriander, lime zest & juice, ginger, garlic, chilli & cayenne pepper in a dish. Score seabass fillets on skin side & put in same dish. Coat thoroughly with the oil. Cover & put in fridge for a couple of hours if possible to marinate. Remove. Pre heat oven to 180°C/350°F/Gas Mark 4 (160°fan). Remove fish from marinade, leaving some of the oil in the dish. Toss onion & peppers in the remaining oil. Put onion & peppers in oven & roast for 10 mins. Add courgettes. Toss with onion & peppers & roast for 10 mins. Add cherry tomatoes, whole & cook for 6 more minutes. As tomatoes are put in oven, heat a large frying pan on hob. Fry sea bass,along with its marinade, skin side down for 3 minutes, then turn & cook for a further 3 minutes. 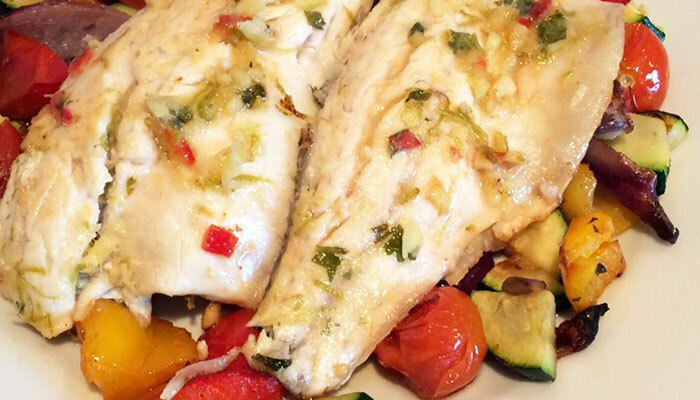 Put roasted vegetables on a serving plate & sit seabass on top. Serve immediately. TOP TIP: The seabass does not require any further oil for cooking. It will cook in its own marinade. Mix 1 tbsp of the olive oil, coriander, juice of 1/2 lemon, ginger, 1 garlic clove, 1/2 green chilli, cumin & honey in a dish. Put fish fillets in same dish, score on skin side & coat thoroughly with the oil. Heat the other 1 tbsp olive oil in a frying pan. Add pine nuts. Cook gently until nicely toasted. Remove & set aside. Add 1 red chilli, 1 garlic clove, onion & pepper to pan & cook for 3-4 minutes. Add juice of 1 lemon & keep warm. Whilst greens cooking, heat large frying pan on hob. Pan fry sea bream on a medium heat, in its own marinade, skin side down for 2-3 minutes. Turn & cook for 2 further minutes. Drain greens well. Toss with chilli, garlic, onion, pepper & pine nuts. 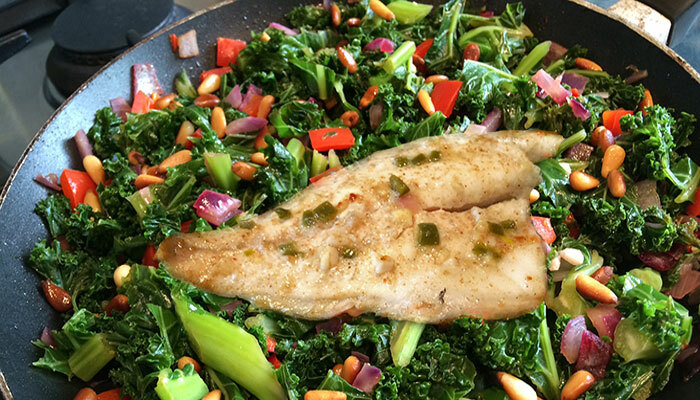 Put greens on a plate & top with sea bream. Serve. TOP TIP: Use any white fish fillets & adjust cooking as per instructions. 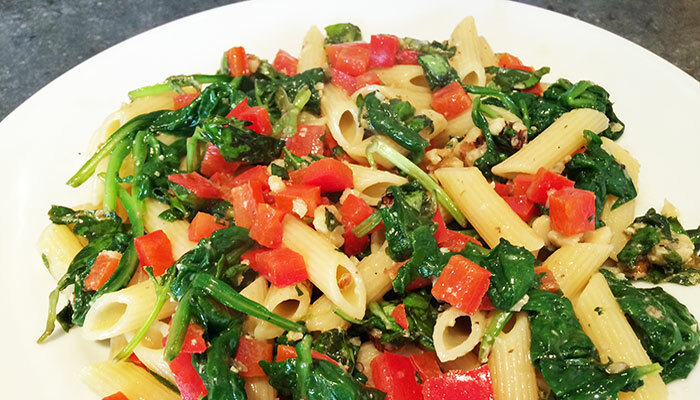 Kale or Spinach are lovely greens to use for this dish. Pre-heat oven to 200°C/400°F/Gas mark 6 (180°Fan). Cut a large piece of baking foil & open it out. Spray centre of foil with olive oil spray. Lay salmon skin side down in centre of foil. Pour oil, lemon juice & zest into a bowl. Add dill & garlic clove & mix together. Toss in the courgettes, onion & cherry tomatoes & coat. Remove vegetables with a scoop & drop in foil around salmon. Pour remaining liquid over salmon. Bring sides of foil together & seal to form a parcel. Transfer to oven. Bake for 15 minutes. Remove & leave to stand for 5 minutes. Carefully open the foil. Serve immediately. TOP TIP: This is one of the quickest meals you will ever make. You can also pre-prepare it & leave foil parcel to marinate. Cut aubergine into chunks. Blanche in boiling water on hob for 2 minutes. Remove aubergine but keep water. Trim shallots. Parboil in remaining boiling water for 2 minutes with skins on. Plunge into cold water for 1 minute. Drain & remove skins. Heat 1 tbsp of the oil on a baking tray in the oven. Place shallots, peppers, aubergine & tomatoes on baking tray & coat with the hot oil. Cook for 10 minutes for "al dente" vegetables or longer if you prefer them softer. Set aside on a plate & keep warm. Heat another 1 tbsp of the oil in a large, lidded pan, on the hob. Add garlic, cumin, coriander & paprika & fry over a gentle heat for 1 minute, stirring. Prepare stock. Add stock, saffron strands & black pepper. Stir & bring to boil. Stir in couscous. Cover pan, remove from heat & leave for 5-8 minutes to absorb stock. Meanwhile, heat last 1/2 tbsp of oil in a frying pan. Pan fry trout fillets according to packet instructions. Fluff couscous with a fork. Stir in the vegetables, juice of 1 lemon, raisins, mixed herbs & almonds. 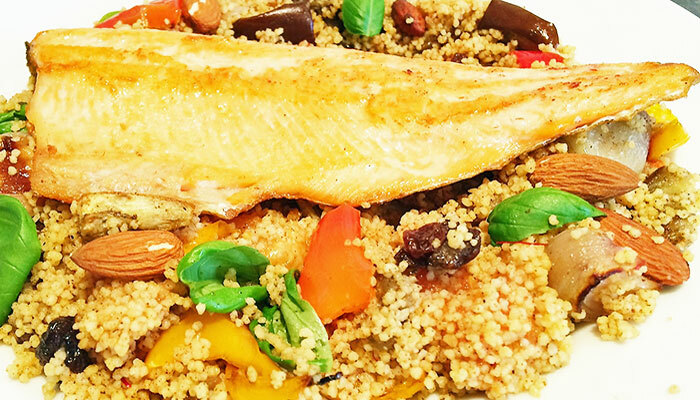 Serve couscous topped with the pan-fried trout. Squeeze juice of 1/2 a lemon over trout fillets. Serve immediately. TOP TIP: If you are cooking for less than 4 people, it's great to still make the full batch of couscous & serve for lunch the following day. Remove fish from marinade, keeping remaining marinade to one side. Fry fish on a medium heat for approx 4 minutes each side. Remove & set aside. Keep pan & it's cooking juices. Cook pasta according to packet instructions then drain & set aside. Whilst pasta cooking, re-heat cooking juices with remaining marinade. Stir fry peppers for 2-3 minutes. Add spinach & cook until wilted. 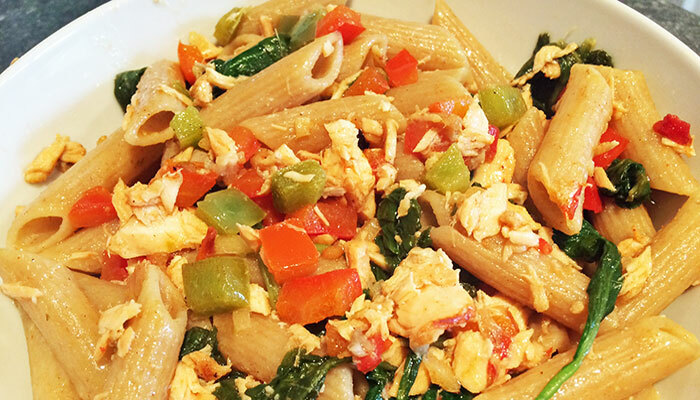 Flake salmon & mix in with peppers & spinach. Stir in pasta & heat through. Stir in the juice of 1/2 lime & serve immediately. TOP TIP: Cooking the salmon doesn't require any further oil as there is plenty in the marinade. It is easier to cook the full salmon fillets & then weigh 120g once flaked rather than trying to get the right weight before cooking. Blanche beans & broccoli for 4 minutes.Drain & run under cold water. Make stock & bring to boil in large saucepan then simmer. Heat oil in a large frying pan or wok, add onion & cook for 2-3 minutes. Stir in the rice, wine, lemon rind & juice. Add 2-3 tbsps of hot stock. Cook gently until liquid absorbed. Stir continuously. Stir in mushrooms, broccoli, french beans & remaining stock. Cover & simmer for 5 minutes until rice just tender. Add a bit more water if necessary. Remove lemon rind.Serve risotto with freshly grated parmesan. Make stock & bring to boil in a large saucepan. Add broccoli, asparagus, peas & broad beans. Bring back to boil & simmer for 4-5 minutes until "al dente." Keeping the stock, drain the vegetables & set aside. Top stock back up to 800mls with hot water & keep on a low heat. Heat oil in a large frying pan or wok. Cook leeks on a medium heat for 2-3 minutes. Stir in the rice. Add 4 tbsps of hot stock. Cook gently until liquid absorbed. Stir continuously. Stir in pesto, black pepper, vegetables & basil. Cook for a few more minutes until vegetables heated through. Whilst warming through, heat a small frying pan on a low-medium heat. Dry fry pine nuts for 2-3 minutes, shaking pan regularly to avoid burning nuts. Serve risotto topped with the toasted pine nuts if using. 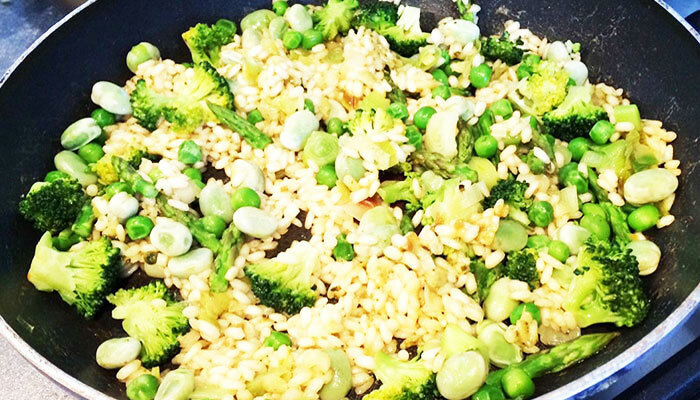 TOP TIP: This dish is a great energy booster and incredibly filling. Dry fry sesame seeds in a small, non-stick frying pan until nicely browned, shaking frequently & being careful not to burn. Set aside. Bring a large saucepan of water to boil. Cook broccoli, corn & red pepper for 2 minutes. Remove vegetables but keep water. Plunge broccoli, corn & red pepper into cold water then drain well & dry on kitchen roll. Boil vegetable water & add penne pasta. Cook according to packet instructions. Drain & run under cold water. Drain again. Mix tahini paste, soy sauce, sugar & red wine vinegar in a bowl. Keep to one side. Heat oil in a wok or large frying pan. Add garlic, ginger & chilli flakes. Cook for 1 minute, stirring continuously. Add broccoli, corn & red pepper. Continue to stir fry for 3-4 minutes on a high heat. Reduce heat & add penne & tahina mix, stirring thoroughly. Heat through for a couple of minutes. 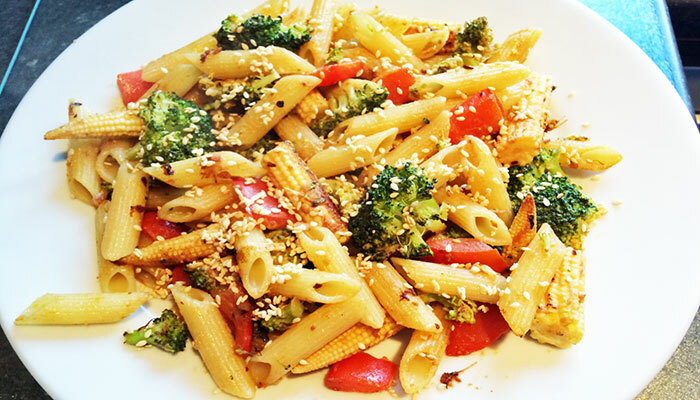 Serve pasta sprinkled with black pepper & the toasted sesame seeds. TOP TIP: You can exchange the broccoli for other seasonal greens such as asparagus tips or mangetout if you wish. Preheat oven to 200°C/400°F/Gas Mark 6 (180°fan). Grease pastry tin with 1 tsp of the oil. Line dish with pastry, allowing overlap of edges. Roll rolling pin over top of tin to neaten edges. Trim any excess pastry. Line tin with greaseproof paper. Fill with baking beans. Turn oven down to 180°C/350°F/Gas Mark 4 (160°fan). Heat the other 1 tsp of olive oil gently in large frying pan. Sweat onions for a few minutes. Add spinach & stir until wilted. Transfer to tart base. Add ricotta. Mix creme fraiche & eggs together & stir in garlic & chilli flakes. Pour over tart. Dot around tomato halves, cut side down. Bake on bottom shelf of oven for approx 30 minutes until set & golden. Whilst tart cooking, heat the 1/2 tbsp oil in oven in a roasting dish. Toss sliced potatoes, onion, peppers & mixed herbs & roast for 15 mins on top shelf. Add courgettes , coating with the hot oil. Cook for further 10 mins. Add whole tomatoes for final 5 minutes of cooking. 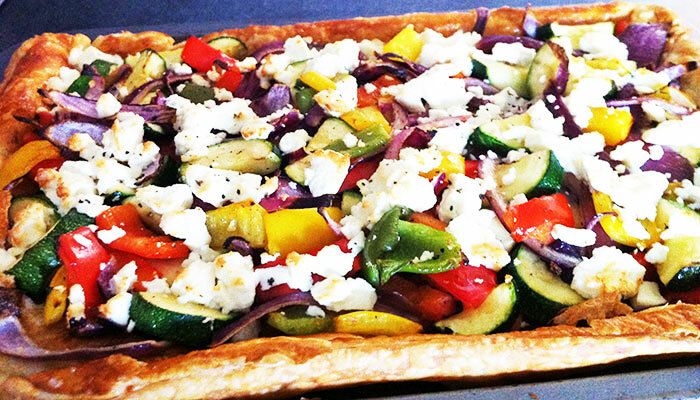 Slice tart & serve with the crispy potatoes & roasted vegetables. TOP TIP: Creme fraiche needs to be healthy living or Sainsbury's Be good to yourself range to fit within nutritional values. I have found reduced fat ricotta can be hard to get. You can use Asda, italian ricotta instead which has better values than some of the other ricottas & will still fit values. Heat oil in a large lidded pan. Fry onion, chillis & celery gently for 5 minutes, stirring occasionally. Stir in tomatoes, fiery chilli ketchup, tomato ketchup, parsley & oregano. Cook for 2-3 minutes. Prepare stock. Add stock & bring to boil. Cover & simmer for approx 40 minutes or until stock well reduced, stirring occasionally. Drain & rinse cannellini beans, kidney beans & sweetcorn under cold running water. Add to pan & cook for approx a further 20 minutes, stirring occasionally. As beans & sweetcorn added, bring a pan of water to boil. Cook basmati & wild rice according to packet instructions (usually around 20 minutes). Drain rice well & serve with vegetable chilli. TOP TIP: You can use hot chilli sauce in place of fiery chilli ketchup if you prefer. Always opt for beans canned in water. Heat the 1 tbsp rapeseed oil in a large lidded pan. Add cumin seeds & onions & fry for 4-5 minutes, stirring occasionally. Add cauliflower, swede, sweet potatoes & potatoes & cook for 3-4 minutes, stirring occasionally. 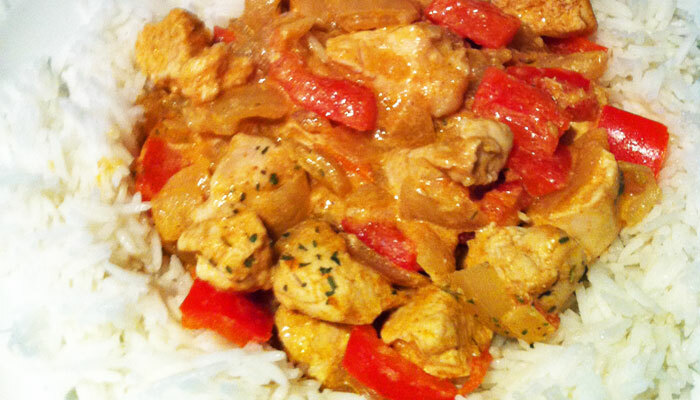 Stir in 2 cloves of the garlic & the ginger, then sprinkle over curry powder & black pepper. Add green beans, peas & tomatoes. Cook for 2-3 minutes. Prepare stock using 1/2 of the stock pot & 300mls of the water. Add stock. Bring to boil & simmer for 25-30 minutes, until stock reduced, stirring occasionally. Whilst curry cooking, prepare stock using remaining 1/2 stock pot & 400mls water. Lightly crush the cardamom pods & coriander seeds. Heat the 1/2 tsp olive oil in a non-stick pan. Fry spices & remaining clove of garlic for 1 minute, stirring all the time. Add rice & stock. Bring to boil. Cover & simmer for 15-20 minutes, until rice tender, stirring occasionally. Toast sunflower & sesame seeds lightly. Remove cardamom pods. Stir seeds into rice. 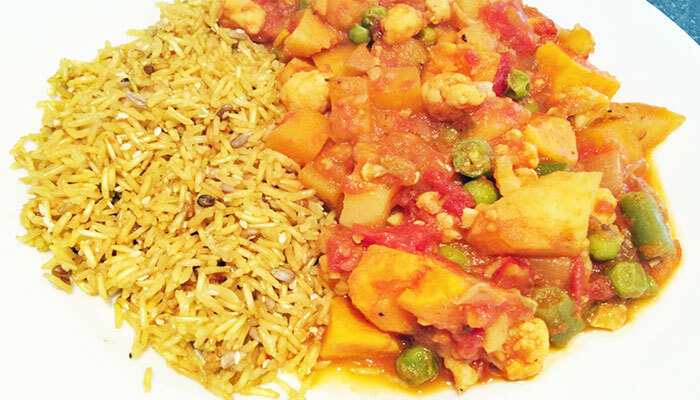 Serve vegetable curry with the rice. TOP TIP: You can use any variety of vegetables you want in this curry. Boil a pan of water & cook pasta according to packet instructions. Drain well. While pasta is cooking, put walnuts, basil, 1 of the garlic cloves, the 1 tbsp of extra virgin oil, black pepper & salt into a food processor. Process to a course pesto. Heat the 1 tsp Olive oil in a frying pan. Fry the red pepper & other garlic clove for 2-3 minutes. Add spinach & cook until wilted. Turn off heat. Stir in the pasta & pesto. TOP TIP: Cooking the red pepper for just a couple of minutes keeps the crunch which is nice against the softness of the pasta & spinach. Heat oil on hob in an oven-proof saute pan. Fry onions, courgettes, pepper, garlic & mushrooms for 2-3 minutes. Season with 1/4 tsp of the salt & the black pepper. Whisk eggs in a jug & stir in creme fraiche & chilli flakes. Cook for 2 minutes over a low-medium heat without stirring. Transfer pan to oven & bake frittata for 25-30 minutes until set in middle. Cook new potatoes in boiling water (with the other 1/4 tsp salt) for 20 minutes, or until tender. Drain. For last 5 minutes of cooking frittata, add tomatoes to oven. 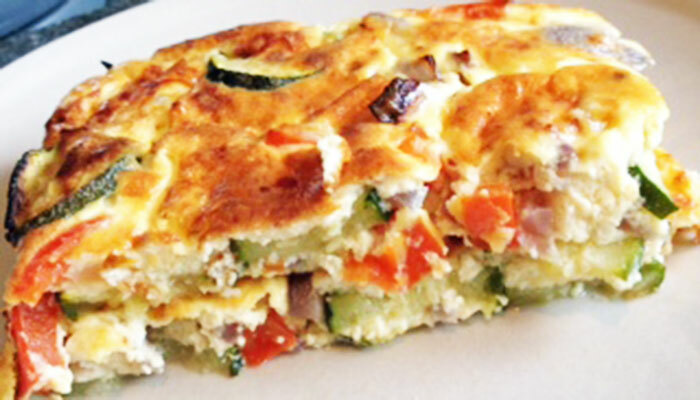 Cut frittata into 2 portions & serve with new potatoes & tomatoes. TOP TIP: Adjust the amount of chilli flakes according to the amount of spice you prefer. Pre-heat oven to 200°C/400°F/Gas Mark 6 (180°Fan). Remove pastry from fridge. Add courgettes, peppers & onion to a roasting tin. Drizzle over 1 tbsp of the olive oil & toss until vegetables coated. Cook in oven for 10 minutes. Remove & set aside but keep oven on. Cut pastry to required weight & transfer to a non-stick baking sheet. Score a line about 1 inch from the edges of the pastry, all the way round. Brush pastry rim with egg wash. Put on middle shelf of oven for approx 15 minutes until pale golden. Once removed, push puffed up middle back down with the back of a wooden spoon. Add roasted vegetables, parsley leaves & crumbled cheese. Put back in oven for a further 10-15 minutes on middle shelf. Heat remaining 1 tbsp oil in a large non-stick roasting tray on top shelf. Toss sliced potatoes in oil & roast for approx 15 mins on top shelf. 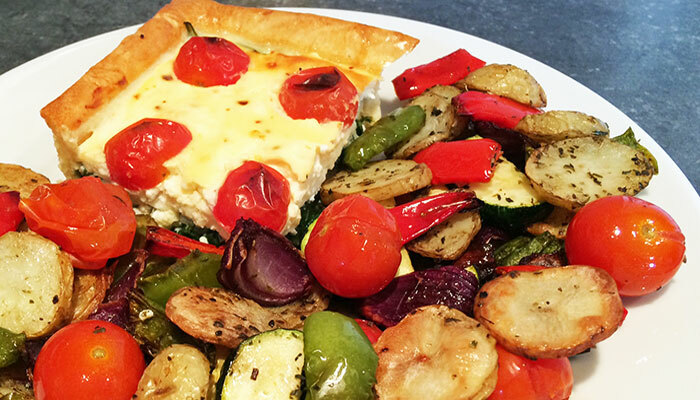 Slice tart & serve with the crispy potatoes & roasted tomatoes. TOP TIP: To avoid tears in the pastry, it's easier to weigh what you are discarding rather than trying to weigh the pastry you will be using. Heat oil gently in a large frying pan or wok. Add garlic, carrots, onions & red pepper. Fry for 2-3 mins or until beginning to soften. Cut aubergine into large chunks & blanch immediately in boiling water for 2 mins. Drain. Add paprika, oregano & aubergine to frying pan & fry for 1-2 minutes. Add mushrooms, courgettes, tomatoes, tomato puree, bay leaves & black pepper. Bring to boil. Cover & simmer on a medium heat for approx 30 minutes, stirring occasionally. Pre heat oven to 190°C/ 375°F /Gas mark 5, (170°Fan). 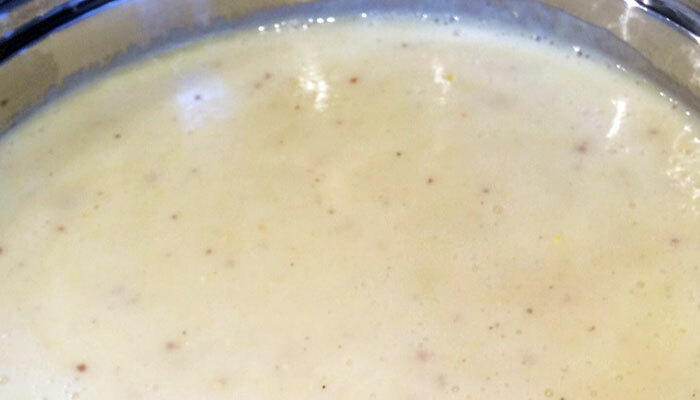 Pour milk into a large lidded sauce-pan. Add onion slices, bay leaves & peppercorns. Bring to boil, remove from heat. Cover & infuse for 10-30 minutes. Strain. Melt olive spread in a large saucepan. Stir in flour. Cook for 1 minutes, stirring continuously. Remove from heat. Gradually pour on warm milk, whisking constantly. Season with salt & nutmeg. Return to heat. Bring to boil, whisking constantly until sauce thickens. 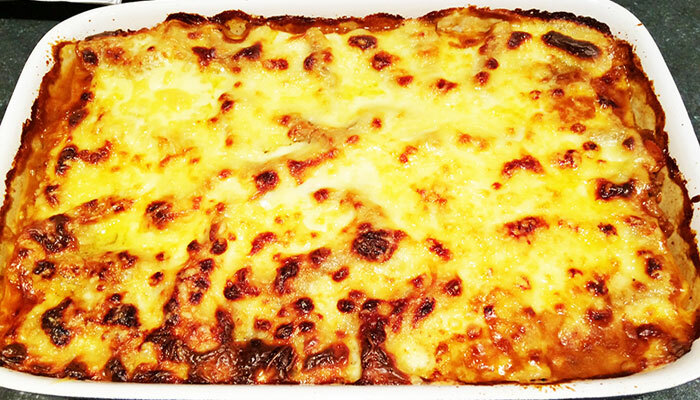 Put 1/2 vegetable bolognaise sauce into bottom of a large ovenproof rectangular dish. Lay 6 pasta sheets on top. Put remaining vegetable bolognaise sauce on top of pasta sheets & lay 6 more on top. 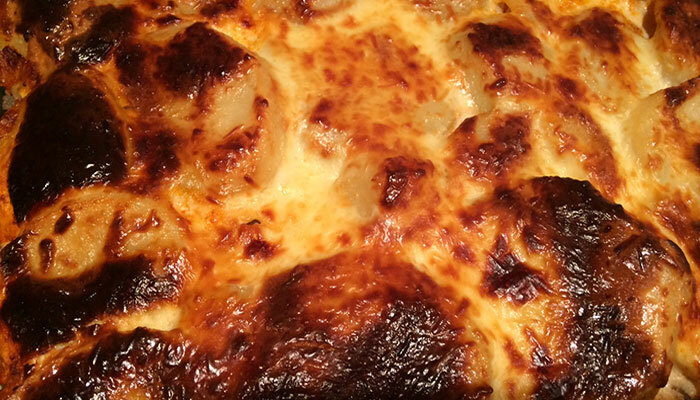 Pour bechamel sauce over pasta sheets & sprinkle with grated cheese. Bake on middle shelf of oven for 40-50 minutes, until piping hot & well browned. Serve with toasted garlic slices. TOP TIP: If you want to save time you can substitute a white sauce, instead of bechamel sauce. Heat olive spread in large non-stick pan. Sweat onion & leeks for 5-10 mins until softened. Add tomatoes, basil & tabasco sauce, if used & cook for 2-3 mins. Prepare stock & add with remaining vegetables. Season with black pepper. Bring to boil. Cover & simmer for 20-30 mins or until all vegetables are tender. 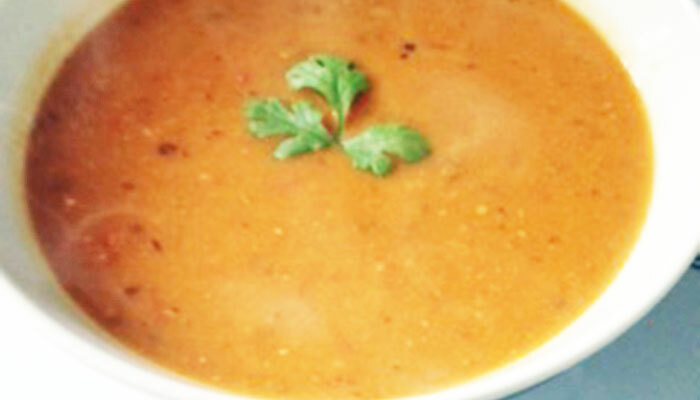 Whizz soup through blender for a very short time, if prefer a thick, hearty soup with chunks of vegetables. 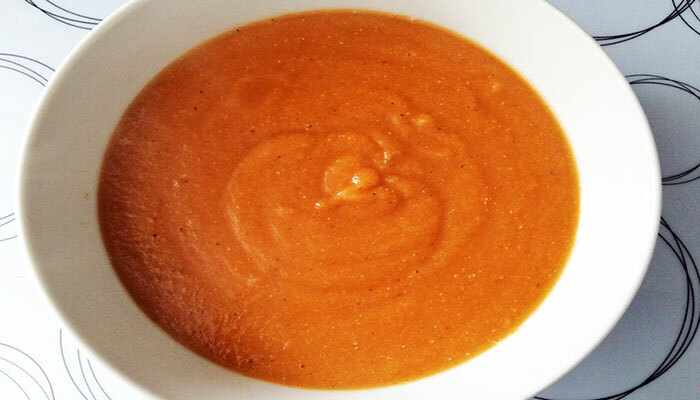 Blend for longer if prefer a smoother soup. Serve with toasted garlic slices ( 2 per person). TOP TIP: For extra quickness & ease, whizz your raw, peeled vegetables (onions & leeks would need to be kept separate)) through a processor! Mix the salt, black pepper & chilli flakes if used, into the whisked eggs. Heat oil in a non-stick omelette pan on a low-medium heat. Fry the baby leeks, pepper & onion for 3-4 minutes. Pour the whisked eggs over the leeks, pepper & onion. Stir the mixture with a wooden spoon ensuring all sides of pan covered. Continue stirring gently until egg starts to set, then stop stirring. Cook for a further 1-2 minutes until omelette cooked underneath. Sprinkle grated cheese over omelette. Put under a hot grill for 1-2 minutes or until egg fully cooked on top of omelette & cheese nicely browned. TOP TIP: Don't stir the egg for too long when added or the omelette may break up. SBGTY* is Sainsbury's be good to yourself range. Add courgettes, peppers & onion to a roasting tin. Drizzle over the olive oil & toss until vegetables coated. Put in oven for approx 15 minutes until pale golden. Put back in oven for a further 10-15 minutes. Prepare herbed leaf salad by putting mixed salad leaves into a bowl. Add mixed fresh herbs & baby sweet peppers. Drizzle over honey & mustard dressing to taste. Slice tart & serve with the herbed leaf salad. TOP TIP: Keep the rectangular shape whilst cutting the pastry. To avoid tears in the pastry, it's easier to weigh what you are discarding rather than trying to weigh the pastry you will be using. 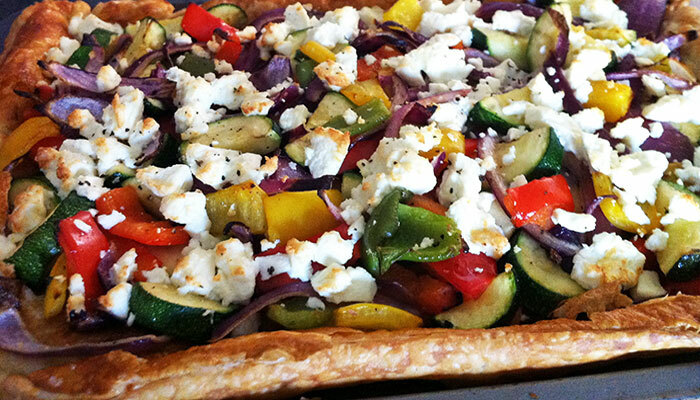 Greek salad cheese lighter is used in place of the traditional feta cheese which is much higher in fats. It is also very difficult to get hold of a reduced fat feta. 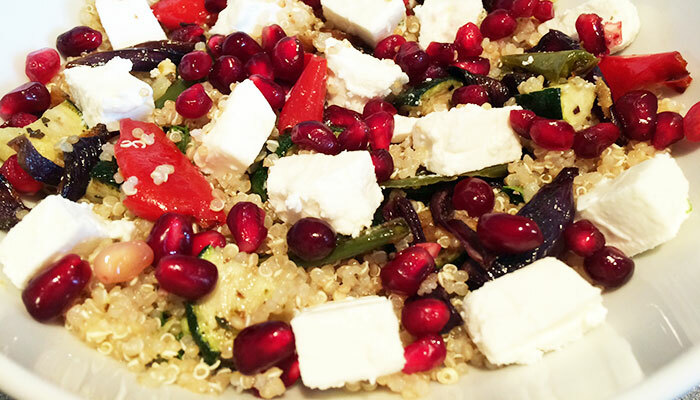 The greek salad cheese is a very tasty substitute. 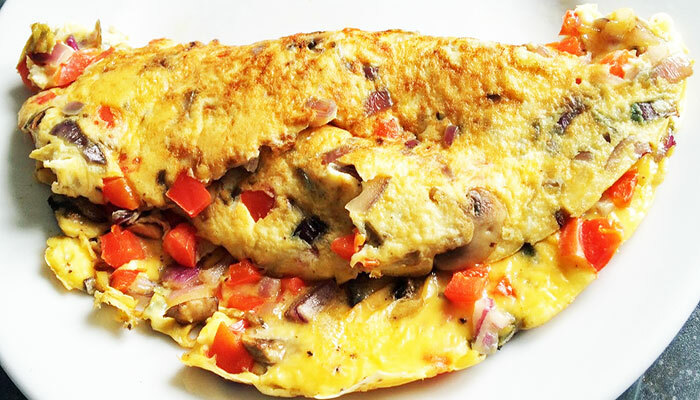 Heat the oil in a non-stick omelette pan. Fry the mushrooms, onions & pepper for 3-4 minutes. Mix the salt & black pepper into the whisked eggs. Pour the eggs over the mushrooms,onions & pepper. Stir the mixture gently with a wooden spoon ensuring all sides of pan are covered. Cook for a further 2-3 minutes until omelette is cooked underneath. Mix 1 tbsp of the olive oil, coriander, juice of 1/2 lemon, ginger, 1 of the garlic cloves, 1/2 green chilli, cumin & honey in a large dish. Using your finger tips, gently massage the mix into the kale. This helps to soften the kale. Cover & leave to marinate for 10-30 minutes. Add red chilli, the remaining garlic clove, onion & pepper to pan & cook for 3-4 minutes. 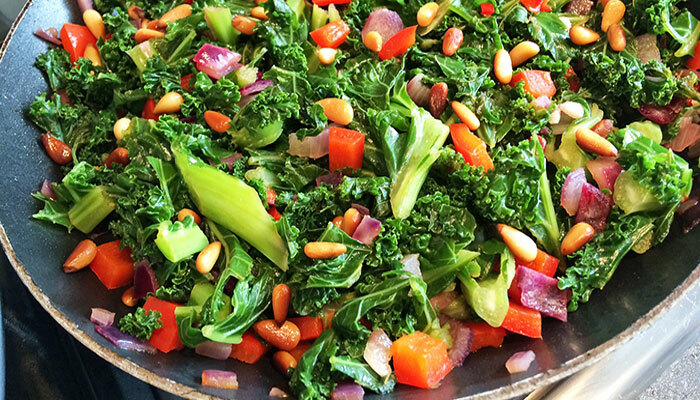 Toss in the marinated kale & pine nuts. Heat through. Serve. TOP TIP: Marinating the kale helps not only to soften it, but also to take away the bitterness, which means that it doesn't need to be cooked for any length of time. This method also helps to preserve its nutritional qualities. Heat oven to 200°C/400°F/Gas Mark 6 (Fan 180°C). Slice aubergine in half lengthways. Cut a border around inside of aubergine leaving a few centimetres around edges. Scoop out the flesh & set aside. Spray aubergine shell with 5 sprays of the olive oil spray. Cover shell with foil & bake for 15 minutes. Remove foil & set aside. Heat a frying pan on hob. Spray remaining 5 sprays of oil in pan & fry pine nuts for 2-3 minutes until nicely browned. Remove from pan & set aside. Heat the 1 tsp oil in frying pan. Sweat onions & garlic for 2-3 minutes. Add aubergine flesh & red pepper. Cook for 2-3 minutes. Add breadcrumbs & cook for a further 2 minutes. Remove from heat. Add mixed herbs, black pepper, pine nuts & tabasco sauce. Stir. Spoon mixture back into aubergine shell. Drizzle with the 1/2 tbsp oil. Bake for 10 minutes on bottom shelf. Add tomatoes on vine & cook for a further 5 minutes. TOP TIP: Use bread that is a couple of days old & fold it in half prior to grating. It grates more easily. Flake the mackerel fillets into a dish. Warm the square wrap under the grill. Spread the pesto on the warm wrap. 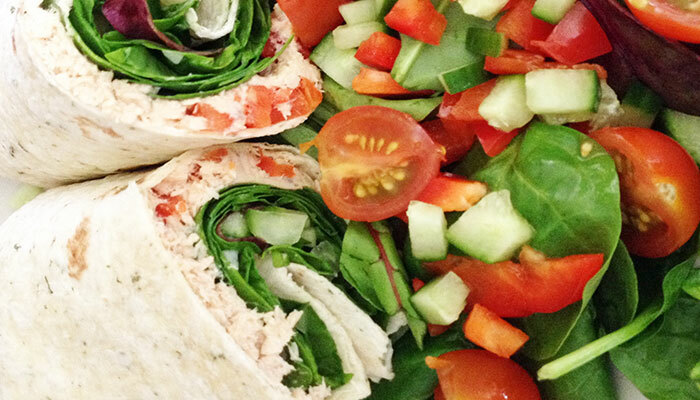 Top the wrap with the salad leaves, cucumber & tomatoes. Sprinkle with the mixed fresh herbs. Scatter the flaked mackerel fillets. TOP TIP: This dish is nice with the mackerel & tomatoes grilled & served warm. Mix spices, black pepper & brown sugar together. Coat chicken pieces. Heat small frying pan. Spray with frylight. Cook chicken pieces on all sides for approx 6 minutes or until fully cooked. Heat oil in large non-stick frying pan. Cook onion & peppers until "al dente". 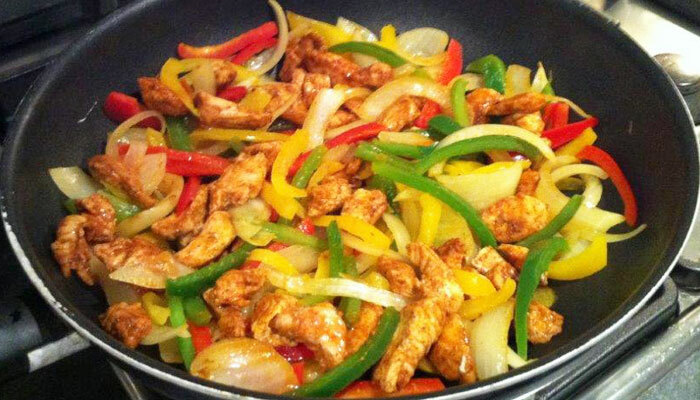 Add chicken to peppers & mix together. Toast pitta bread until warm but still soft. Make a slit across the top of the pitta bread & gently open it up ready for the filling. Spoon in the sour cream & salsa & spread round sides with back of a spoon. 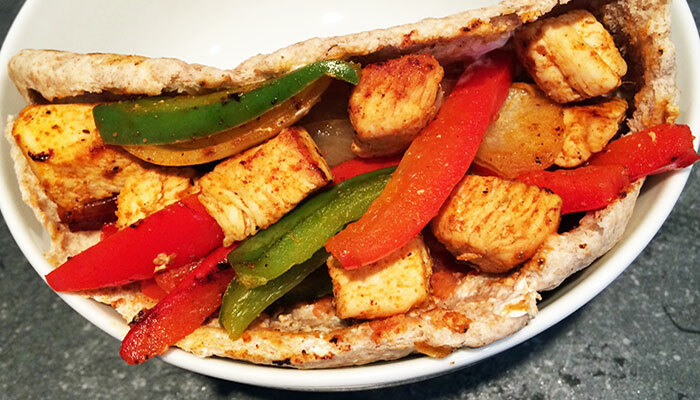 Fill pitta with chicken & peppers. Serve warm. TOP TIP: Running a knife gently through the top of the pitta bread whilst cold, will help open it up ready for the filling. It is harder to do this when hot! Drain tuna & put into a dish. Stir in mayonnaise & black pepper. Add spring onions & pepper & mix together. Cut ciabatta rolls in half. Spread filling onto bottom half of rolls. Cover with top half of ciabatta. TOP TIP: This sandwich really packs a filling! Add any fresh herbs if you like. Prepare mixed salad by putting salad leaves, cucumber, baby peppers & half the chopped celery into a bowl. Mix cream cheese with rest of celery in a dish. Spread cream cheese on one slice of the bread & lay other slice on top. Cut into quarters. 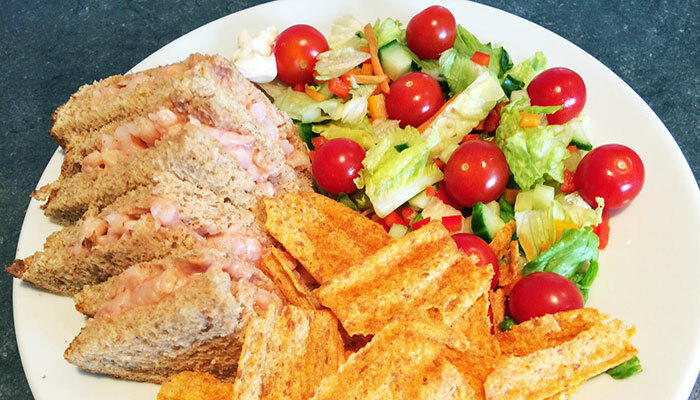 Serve sandwich with the salad, garlic & herb dressing & crisps. Separate the sandwich thin into 2 halves. Spread 1 tsp pesto onto each half. Put mackerel fillets into a small dish & mash with a fork. Spread the fillets over one half of the sandwich thin. Top with salad leaves & cucumber. Cover with other half. Press sandwich thin together gently. 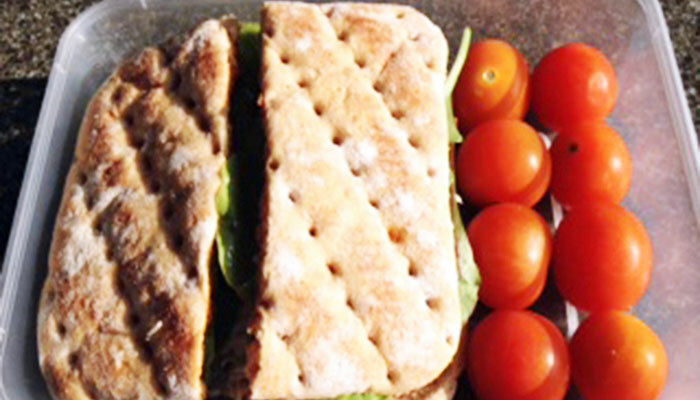 Serve sandwich thin with cherry tomatoes on the side. In a dish, mix salmon with lemon juice, mayonnaise & black pepper. Spread salmon across wraps, leaving a gap around the edges. Scatter 1/2 of the spinach, cucumber & red pepper over wraps. Fold wraps & slice each wrap diagonally into 2 halves. 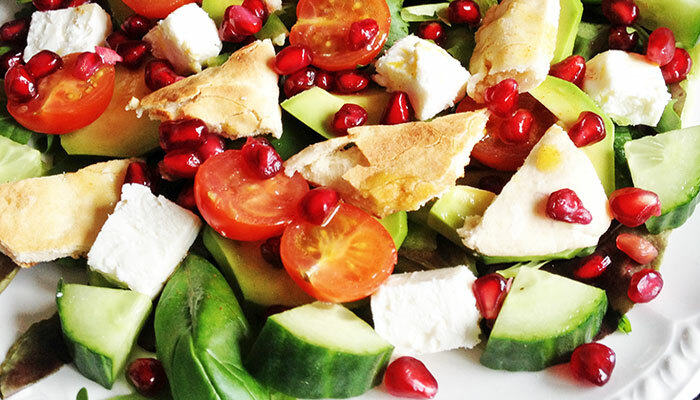 Use remaining half of spinach, cucumber & red pepper as the mixed salad. Scatter cherry tomatoes over mixed salad. TOP TIP: I buy skinless & boneless salmon as i hate coming across any bones in my fish. High in Omega 3, providing 85g of oily fish per serving. Drain the tuna & flake into a dish. Mix in the mayonnaise, black pepper, sweetcorn & red pepper. Make a slit across top of pitta bread & gently open it up ready for filling. 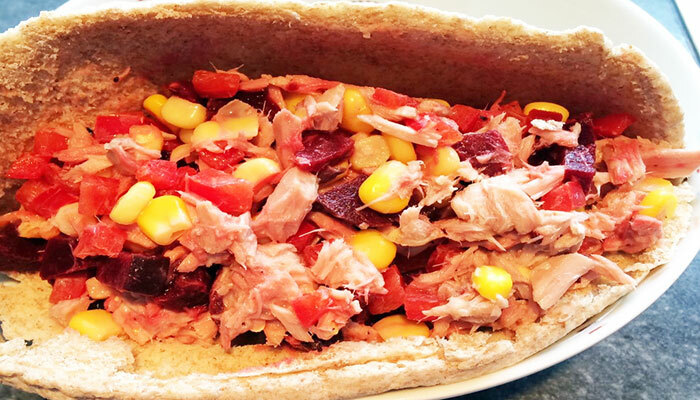 Fill pitta with tuna mix. Serve. TOP TIP: Running a knife gently through top of pitta bread whilst cold, will help open it up ready for filling. It is harder to do this when hot! Fry garlic clove, spring onions & red pepper on a medium heat for 2 minutes. Turn off heat. Mix in tuna. Slice panini in half so you have a bottom & top half. 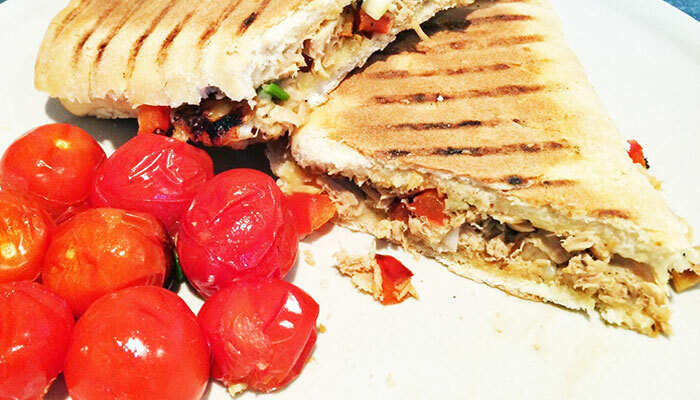 Spread tuna mix onto bottom half of panini. Top with cheese slices. Cover with top half of panini. Toast in panini press for 5-8 minutes. Whilst panini toasting, grill cherry tomatoes. 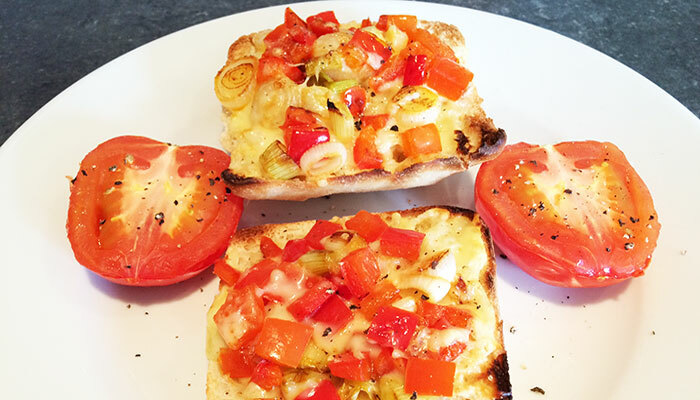 Slice panini through middle diagonally & serve with tomatoes. TOP TIP: Leave the middle of the panini free of cheese so that when you slice it, it doesn't ooze out. Mix the 1/2 tbsp mayonnaise & ketchup together in a bowl. Add prawns. Scatter the sweet leaf salad on a plate, along with cucumber, peppers & tomatoes. Spread the prawns in between the bread. Cut into triangles. Place sandwich on the plate with the salad. Squeeze an additional 1tsp mayonnaise at side of salad. TOP TIP: If you are not bothered about the crisps, you can double the amount of prawns, mayonnaise & ketchup to make a really chunky sandwich! Heat a non-stick frying pan on the hob. Spray rapeseed oil into frying pan. Add diced chicken pieces & cook for 8-10 minutes or until cooked through. Set aside but keep warm. Grill tomatoes for a few minutes if you prefer them warm. When nearly done, warm wrap under grill before turning off. 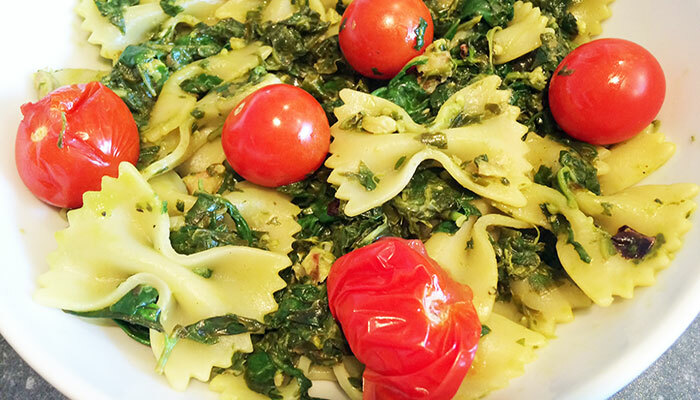 Scatter over spinach leaves, peppers & basil. 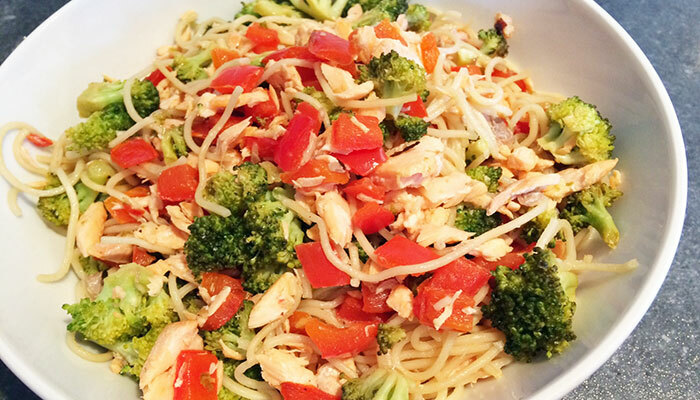 Top with tomatoes & chicken & serve immediately. TOP TIP: Warming pesto up slightly makes it easier to spread on the wrap. Slice 50g of roast chicken (no skin) & set to one side. Spread olive spread on 2 pieces of bread. Put a handful of mixed salad leaves into a dish & roughly chop. Cut cucumber in half. Cut 1 half into pieces & save other half. Throw cucumber pieces in with salad leaves & add dressing. 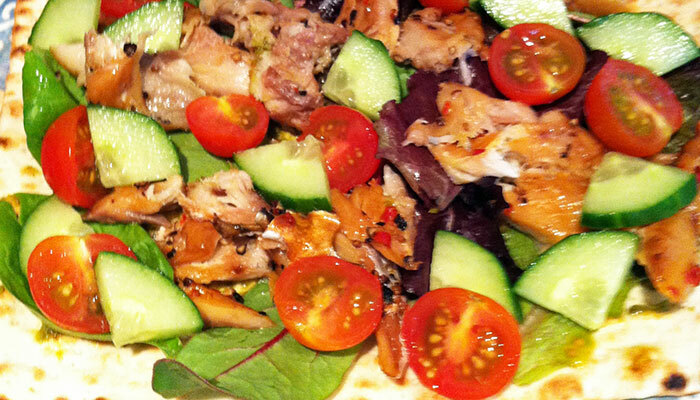 Put salad leaves on one slice of the bread & top with chicken slices. Cover with second slice & cut into triangles. Serve with tomatoes & other half of cucumber on side. TOP TIP: This is great to use up left over chicken after a roast dinner. You can buy cooked ready-to-eat chicken pieces if you want to save time & calories, but it can work out quite a bit more expensive & isn't quite as tasty! If you are making this sandwich in a lunchbox, i would recommend you keep the dressing in a separate little pot & add it just prior to eating so the sandwich doesn't go soggy. Boil eggs for 10 minutes. Drain & leave to cool. Shell. Mix salad leaves, cucumber & baby peppers. Chop eggs in a small bowl & mix with the 1 tbsp of salad cream. Mix in cress & black pepper. Spread mix on 1 slice of the bread & lay other on top. Cut into triangles. 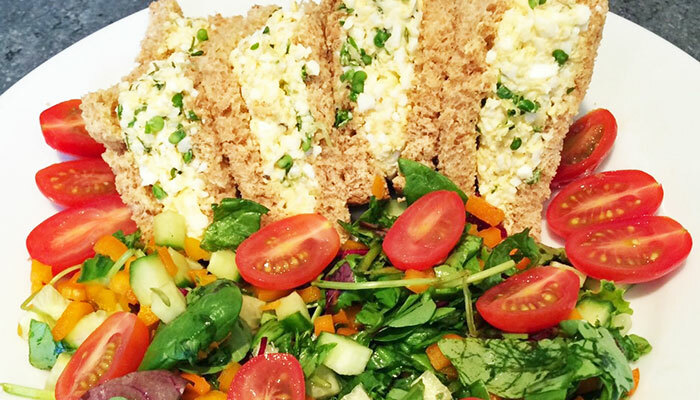 Serve sandwich with mixed salad, tomatoes & the other 1 tsp of salad cream as a dressing. TOP TIP: You can't beat salad cream for taste in this classic British sandwich. If you are not overly hungry, just use 1 egg instead of 2 as it is very filling! Heat oil in a small frying pan. Fry spring onions & pepper for 2-3 minutes. Heat the grill. Slice ciabatta roll in half. Lightly toast one side of the ciabatta halves. Put 1/2 the spring onions & pepper on untoasted halves of ciabatta. Top with grated cheese & rest of spring onions & pepper. Toast ciabatta halves under grill along with tomato halves. TOP TIP: Keep grill on a medium rather than high heat to allow cheese to bubble & brown without burning bread. Heat the olive oil in a large pan &, with the lid on, gently sweat the onions, celery & leeks for 5-10 mins until soft. Prepare the stock. Add the milk to the stock & mix. Add to pan & bring to the boil. Add potatoes & black pepper. Bring back to the boil, cover pan & simmer for 20 mins until potatoes soft. Turn off the heat. Stir in the mustard if used. Whizz through blender. Put back on a low heat, stirring occasionally. Crush the garlic clove into a small dish. Add the olive spread & mix together thoroughly. Spread onto both halves of the roll & toast under a medium grill. Serve the soup with the toasted roll. TOP TIP: I recommend you use the mustard in this soup. I don't like the taste of mustard on its own but love it in this soup. It really makes a difference & gives it a nice silky smoothness. Soak Country soup mix overnight as per packet instructions. Rinse with fresh, cold water, drain & set aside. Heat oil over a medium heat in a large pan. Add onions, celery, carrots & potatoes & fry for 5 minutes. Prepare stock. Stir in the stock, mixed herbs, pre-soaked country soup mix & tomato puree. Bring to boil then simmer with a lid on for 1 hour & 45 minutes, stirring occasionally. Toast the pitta bread & cut into wedges. Serve broth with the toasted pitta wedges. TOP TIP: Real comfort food & very warming & filling on a cold day. Cook lentils in a pan of boiling water according to packet instructions. Drain & set to one side. Heat a large saucepan. Dry fry cumin seeds & chilli flakes for about 1 minute. Add olive oil, onion, carrots & pepper & cook for 5-6 minutes on a medium heat. Stir in the cooked lentils. Prepare stock. Add to pan, along with tomatoes. Bring to boil. Cover & simmer for 20- 25 minutes. Whizz soup through a processor. Pour back into pan. Drain & rinse chickpeas under cold water & add to pan. Re-heat soup on a gentle heat stirring occasionally. Toast bread & leave in toaster to crisp up. Slice into strips. Serve soup into bowls. Top with coriander. Serve with crisp toasted slices. TOP TIP: Contains plenty of fibre & is a great way to get your pulses. Place peppers, tomatoes & whole garlic cloves on a baking tray. Sprinkle with oregano & 1 tbsp of the olive oil. Coat the peppers & tomatoes in the oil & roast for 30 minutes. Heat the other 1 tbsp oil in a large pan & fry the onion for 10 minutes. Prepare stock & add to pan with tomatoes & peppers. Squeeze the soft cooked garlic from the skins into the pan. Bring to boil & simmer for 30 minutes with the lid on. Whizz soup through a processor & re-heat back on the hob. 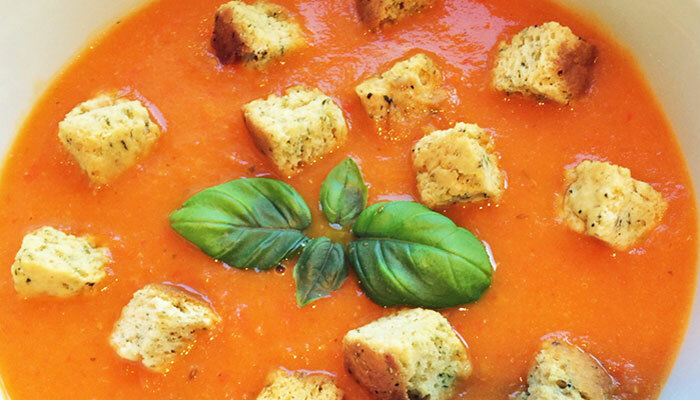 Serve soup topped with croutons & fresh basil. 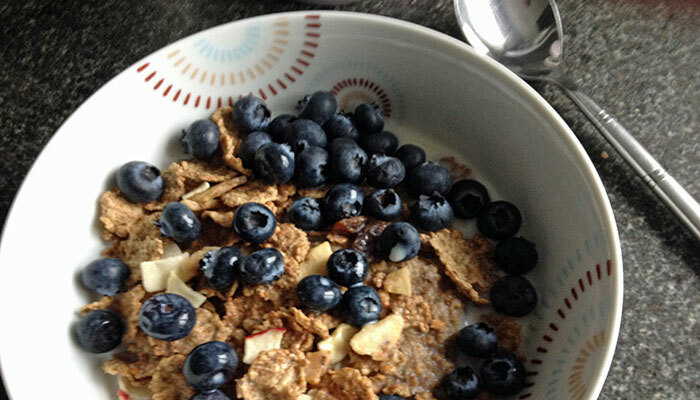 TOP TIP: Very low in calories & a great energy booster. Prepare lentils as per packet instructions. Heat oil in a large pan. Add onions & garlic. Cook gently until onions softened, stirring occasionally. Add carrots, tomatoes & oregano & cook for 3-4 minutes. Prepare stock. Add to pan along with lentils, red wine vinegar, bay leaf & black pepper. Add tabasco sauce if using. Bring to boil. Cover & simmer for approx 45 minutes, stirring occasionally. Remove bay leaf. Whizz through a blender or processor until desired consistency. Put back in pan & re-heat. TOP TIP: Buy lentils that don't need to be pre-soaked. Heat oil gently on hob in a large pan. Sweat leeks & onions gently for 5 minutes. Prepare stock. Stir in black pepper. Add stock to leeks & onions. Add potatoes & broccoli. Bring to boil. Cover & simmer for 25 minutes until vegetables soft. Whizz through a processer or blender until smooth. Put back on hob to re-heat. Mix olive spread with garlic. Cut paninis down middle. Slice across so they have a top & bottom half. Spread olive spread on all halves. Toast under grill. 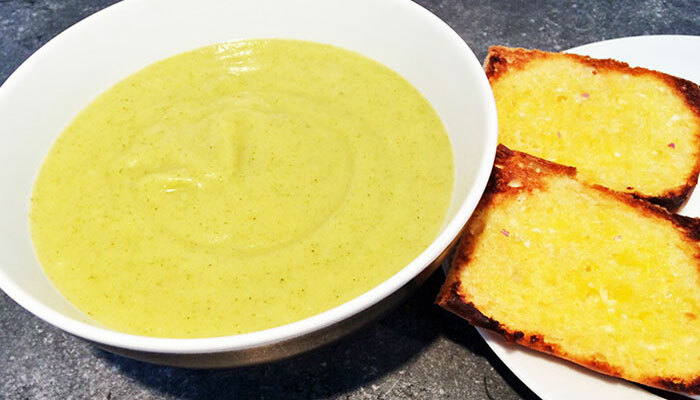 Serve broccoli soup with toasted panini slices. TOP TIP: Use all the broccoli, including the stork to get the best nutrition. Cook potatoes, with skins on, in boiling water with the 1/2 tsp salt for 10-15 minutes until tender. Cook green beans in boiling water for 8 minutes until tender. Drain & rinse both potatoes & green beans under cold water & leave to cool. Boil eggs in boiling water for 10 minutes. Rinse under cold water & leave to cool. Cut lettuce into bite size pieces. Wash under cold water & pat dry on a kitchen towel. Arrange lettuce on 4 large plates or 1 large platter. Shell eggs & cut into 4. Arrange beans, potatoes, eggs & peppers on top of lettuce. Drain tuna & flake into small pieces. Add to plates along with tomatoes, cucumber & basil. Make vinaigrette: Place olive oil, white wine vinegar, lime juice & zest, mustard, caster sugar & black pepper into a screw top container. Shake container until all ingredients are thoroughly mixed. Spoon vinaigrette over prepared salad to taste. TOP TIP: This dish really lives up to its name as a "feast". 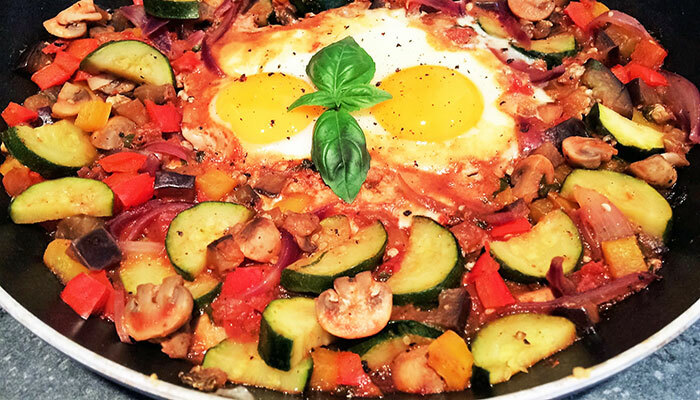 Make sure you are hungry when you make this dish! Lay mixed salad leaves onto individual plates or 1 platter. Scatter over fresh herbs & cucumber. Lay avocado slices around middle. Scatter over cheese cubes & tomatoes. Prepare salad dressing by mixing oil, lemon juice & paprika into a screw top jar. Ensure lid tightened & shake vigorously. Scatter pitta wedges on top of salad. TOP TIP: This vibrant dish tastes as good as it looks and is packed with good nutrients & healthy fats. Heat 1 tsp oil in a small non-stick frying pan. Cook chicken gently until nicely browned. Set aside. Heat 1/2 tbsp oil in large pan. Fry courgettes & pepper for 2 minutes. Make stock. Add saffron to stock if using. Set aside. Add garlic, chilli, spring onions, coriander, cumin & paprika to courgettes & pepper. Gently fry for 1 minute, stirring continuously. Add stock to pan & bring to boil. Add couscous & chicken & stir well. Cover pan, remove from heat & leave for 5 minutes to absorb stock. Stir in juice of 1 lemon. TOP TIP: If you use a George Foreman style grill , you can use even less oil to cook chicken. Cook whole & once removed from grill, cut into pieces. Drain tuna. Drain mixed bean salad & rinse under cold running water. 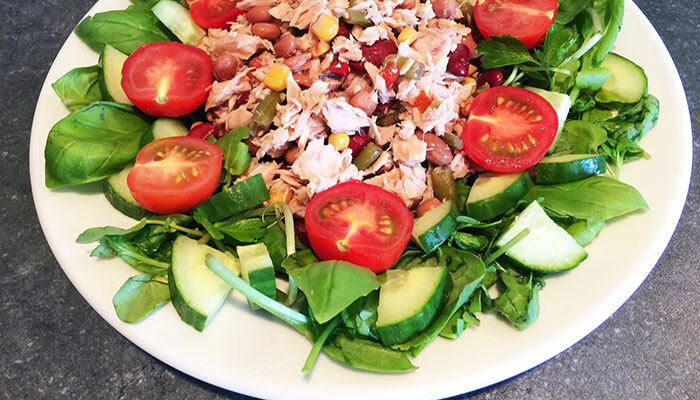 In a bowl, mix the tuna & mixed bean salad together. On individual plates or a platter, scatter mixed salad leaves & mixed fresh herbs. Add cucumber & tomatoes. Top with the tuna & mixed beans. Dress with the honey & mustard dressing. 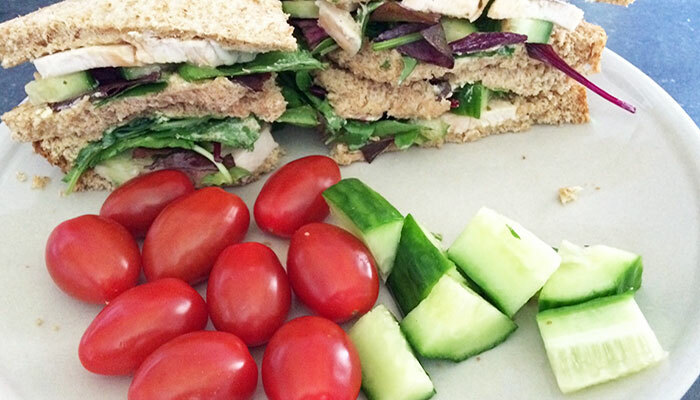 TOP TIP: Takes very little time to prepare & is great to throw into a lunch box as well. If you are eating it later, I would recommend you keep the dressing separate & put it on just prior to eating. Cut the aubergine into chunks. Blanche in boiling water on the hob for 2 minutes & drain. Trim shallots. Parboil for 2 minutes with skins on. Plunge into cold water for 1 minute. Drain & remove skins. Place the shallots, peppers, aubergine & tomatoes on the baking tray & coat with the oil. Heat other 1 tbsp oil in a large, lidded pan, on the hob. Fluff with a fork. Stir in the vegetables, lemon juice, raisins, mixed herbs & almonds. TOP TIP: Lovely served warm on the day of making. Great for throwing into a lunch box & eating cold the following day. Cook edamame beans according to packet instructions. Drain & leave to cool slightly. When beans are finger hot, squeeze from their pods & set aside to cool. Heat oil in a pan & cook pepper for 2-3 minutes. Prepare stock. Add to pan. Stir in couscous. Fluff with a fork. Stir in the lemon juice. 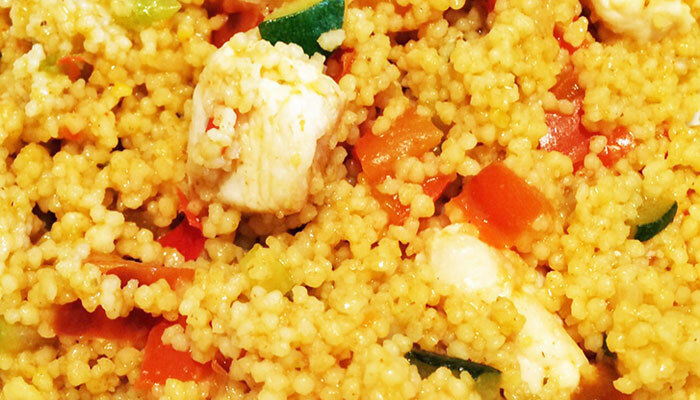 Serve couscous onto individual plates. 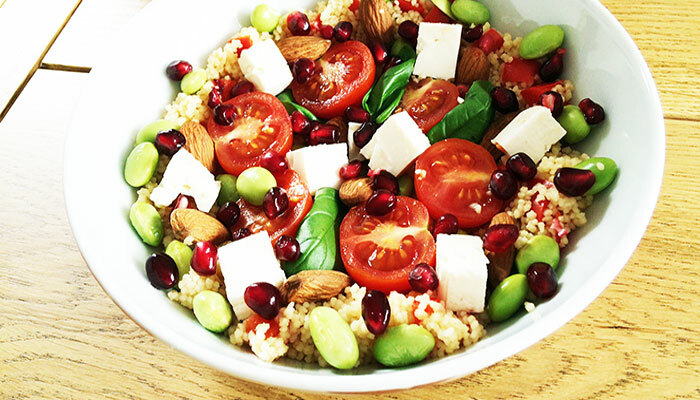 Scatter basil leaves, cherry tomatoes, almonds, edamame beans, cheese & pomegranate seeds. TOP TIP: You can buy edamame beans ready cooked at some stores which does make it quicker but more expensive & they have to be used within a few days unlike the frozen beans in their pods. If you use fresh, cooked beans, use 60g instead of 150g. Pre-heat oven to 200°c /400°F/Gas Mark 6 (180° fan). Wash, dry & prick potatoes. Cook potatoes on top shelf of oven for approx 1 hour, or until tender to prick. 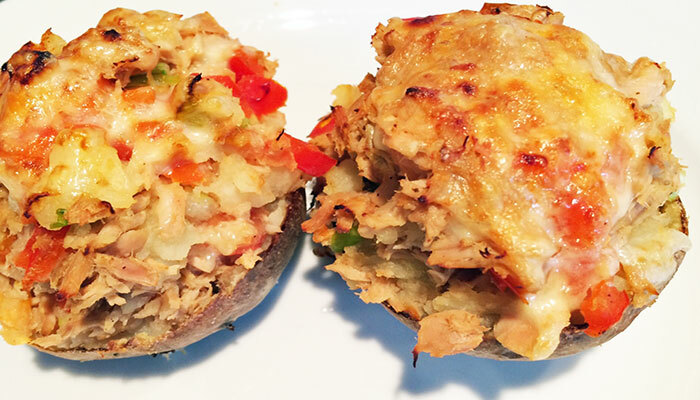 Remove from oven, cut each potato in half. Leave to cook slightly. Flake tuna into a bowl & add lemon juice & tabasco sauce. Scoop out flesh from potato, mix with the salt & then mix in the tuna. Fry spring onions, garlic & pepper for 4-5 minutes. Add tomatoes & black pepper. Stir & cook for a further 2-3 minutes. Add tuna mix & heat until warmed through. Pile the mixture into the jacket skins. Top with the grated cheese & grill until cheese melted & nicely browned. TOP TIP: If you want to quicken up the time this takes to make, microwave the potatoes first & then put in oven to crisp up. Scatter mixed salad leaves on a plate. Add tomatoes, cucumber & chicken slices. Drizzle sweet chilli sauce over the chicken & salad. 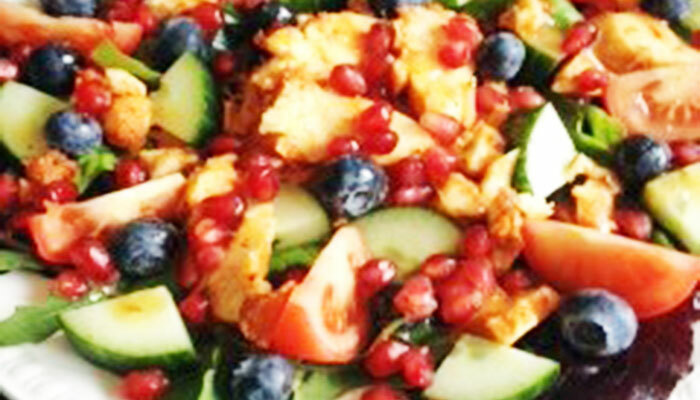 Top with blueberries & pomegranate seeds. 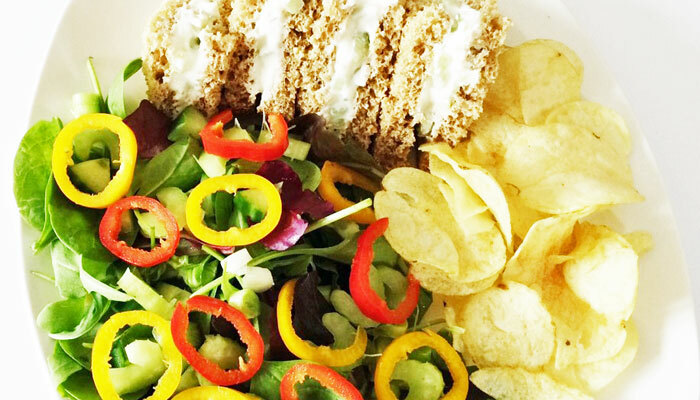 Serve salad with the crisps. TOP TIP: You can use any cooked chicken for this lunch. I chose the sweet chilli & lime because it is so flavoursome. Cook orzo pasta according to packet instructions. Drain & leave to cool. Stir pesto into orzo pasta. Put mixed salad leaves in a serving dish. 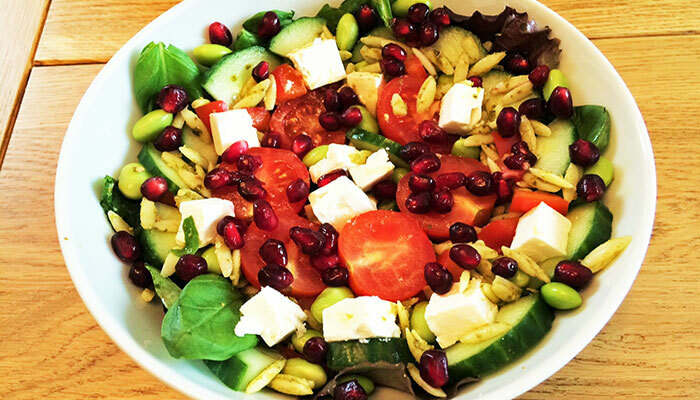 Scatter basil leaves, pepper, cherry tomatoes, edamame beans, cheese, cucumber, orzo pasta & pomegranate seeds. TOP TIP: You can buy edamame beans ready cooked at some stores which does make it quicker but more expensive. As an alternative, you can use frozen soya beans. (Edamame beans are just small soya beans). 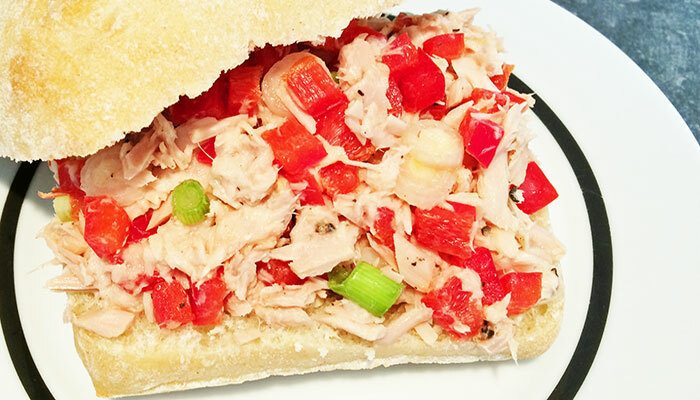 Chop tuna into small pieces. Put in a bowl with ginger, spring onions, chilli & sesame oil. Remove zest & juice from 1/2 of the lime & add. Mix together & shape mixture into 4 fishcakes. Coat each fishcake with sesame seeds. Heat oil in a non-stick large frying pan. Add fishcakes. Shake pan gently to avoid sticking. Fry over a medium heat for approx 2 minutes each side. Mix Coriander, tomatoes, onion & soy sauce in a bowl. Remove zest & juice from remaining 1/2 of the lime & add. Add black pepper & mix thoroughly. Put salsa to one side until fishcakes cooked. Put salad leaves on a plate. Scatter over the cucumber, baby sweet peppers & tomatoes. 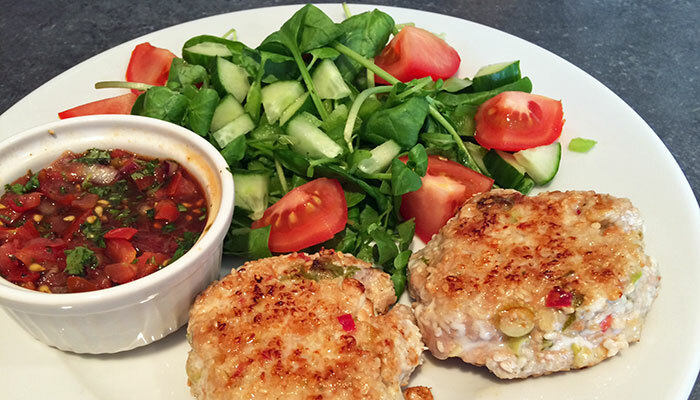 Serve fishcakes with salad & salsa. TOP TIP: Make salsa first. When serving, remove a bit of the liquid from the salsa & drizzle over the salad. Cook Quinoa following instructions on packet. Drain & set aside. Heat 1 tbsp of the oil in a roasting tray. Coat onions & peppers in the hot oil & roast for 10 minutes. Toss in courgettes & whole garlic cloves & roast for a further 10 minutes. When finger hot, squeeze garlic out of their skins. Mash in a small bowl. Stir in the other 1 tbsp of oil, lemon juice & zest, & sugar. Mix with the quinoa. Add roasted vegetables & the parsley. Top with cheese & pomegranate seeds. 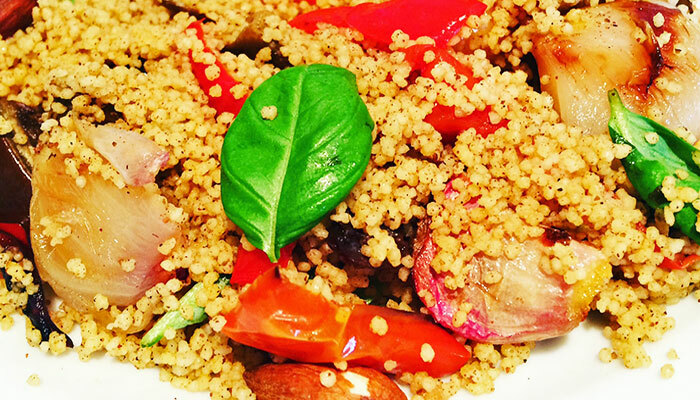 TOP TIP: This dish is nice eaten cold, or with warm quinoa & vegetables. Great in a lunch box too. Spread mixed salad leaves onto a serving plate. Dot around baby sweet peppers, cucumber & tomatoes. Add char-grilled chicken pieces & grated carrots. Whisk together lime zest, juice, fish sauce, sugar, chilli & coriander until sugar dissolves. Add oil. Mix together thoroughly. 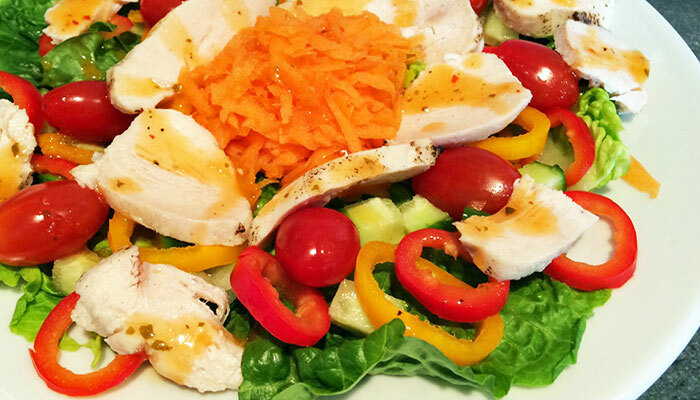 Drizzle dressing over salad & chicken. TOP TIP: You can also use your left over roast chicken for this lunch if you prefer but leave the skin off. Pre-heat oven to 180°C/350°F/Gas Mark 4 (160°Fan). Cook chicken breast in George Foreman type grill, according to device instructions. Chop chicken into small pieces. Put to one side. Slice top off each tomato & scoop out pulp & seeds. Chop pulp & put to one side. Throw away tops, seeds & juice. Sweat onions, garlic & pine nuts for 5 minutes. Grate bread into breadcrumbs. 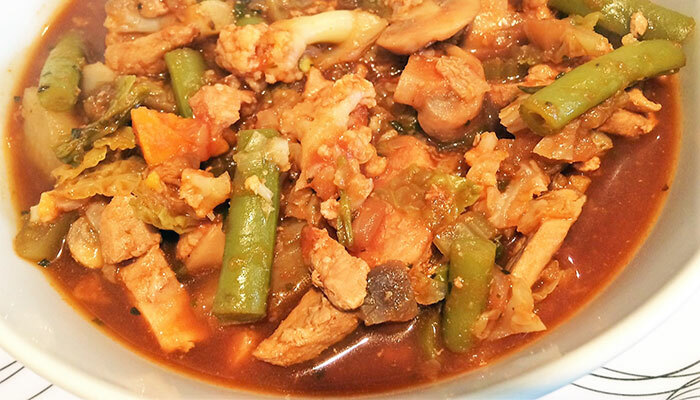 Stir in breadcrumbs & cooked chicken pieces. Cook for a further 2 minutes. Remove from heat. Stir in oregano & black pepper. Add tomato pulp & tabasco sauce & stir well. Spoon mixture back into tomato skins. Bake on bottom shelf of oven for 20-25 minutes. Put salad leaves on each serving plate leaving room for the cooked tomatoes. Add herbs, cucumber & baby sweet peppers. Put garlic & basil leaves into a food processor. Add oil & white wine vinegar. Process until smooth. Dress the salad with the basil vinaigrette. Serve with the mediterranean tomatoes. TOP TIP: Use bread that's a few day's old or put it in fridge before using. It makes it much easier to grate. While pasta is cooking, put walnuts, basil, garlic clove, oil, black pepper, salt, parmesan, lemon juice & spinach into a food processor. Add pesto to pasta & mix thoroughly. Warm through pasta & spinach. Put pasta in a dish. Add tomatoes. Serve immediately. 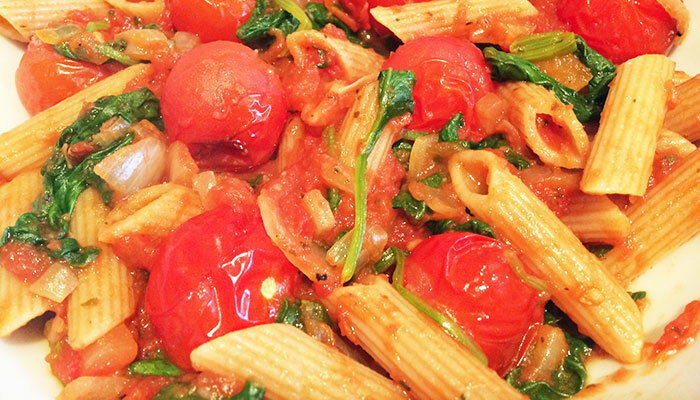 TOP TIP: You can use any pasta with this dish which is a great lunch when you want something warm & quick. Bring a pan of water to the boil. Cook pasta according to packet instructions. Drain. Whilst pasta cooking, heat oil in deep frying pan or wok. Sweat onions & garlic for 3-4 minutes. Add tomatoes, oregano, basil, black pepper & salt & cook for 5 minutes. Add spinach & stir into sauce until wilted. Stir in parmesan followed by pasta & coat thoroughly with the sauce. Cook until pasta heated through. TOP TIP: Try to keep the cherry tomatoes whole once added. 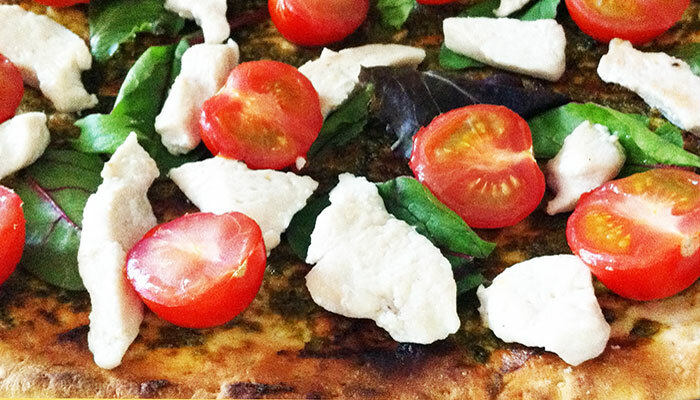 Fresh herbs are also delicious in this dish. If you have any suggestions on any of our menus, please feel free to get in touch via our contact page. We would love to here from you. One cannot think well, love well, sleep well, if one has not dined well! We all eat, and it would be a sad waste of opportunity to eat badly. Cooking well doesn't mean cooking fancy.